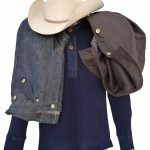 Mister Freedom® HUDSON Jacket, 36 Oz. 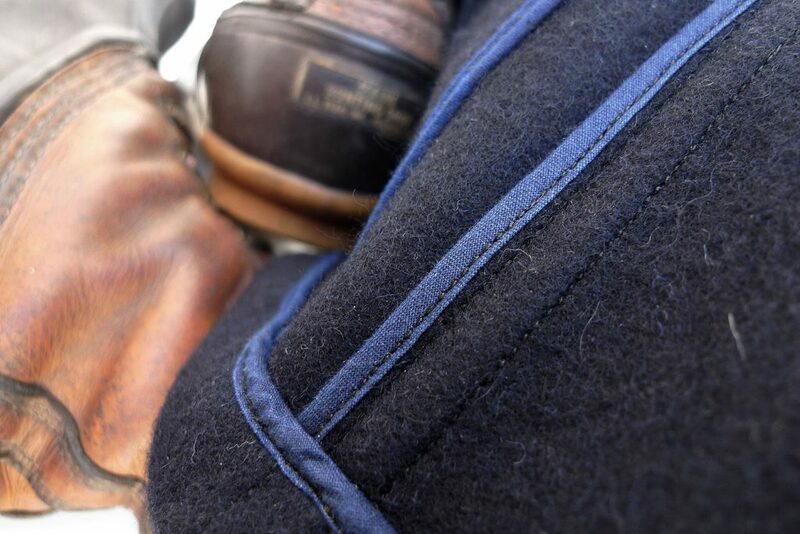 midnight blue Melton wool. We are adding a new vintage classic to the “Surplus” mfsc catalog this season, the Mister Freedom® “HUDSON” jacket, a design inspired by an obscure 1930’s unlined wool coat made by the H.W. 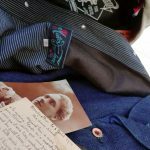 Carter & Sons label (Est. 1859, read the history and some legal tidbits here) and cut from a genuine Hudson’s Bay point blanket. 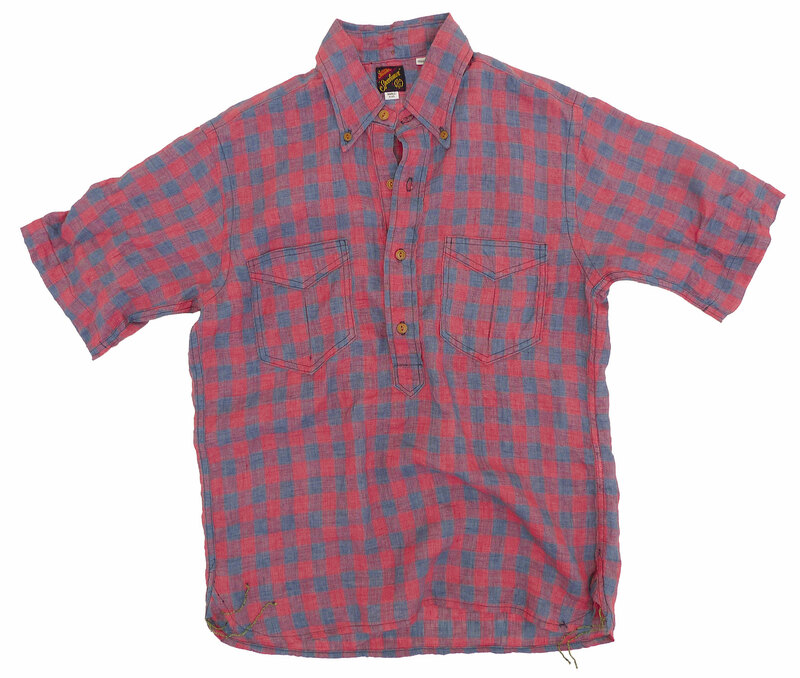 We’d saved this vintage outdoor garment in our archives for quite some time, waiting for the right twist to put on it. 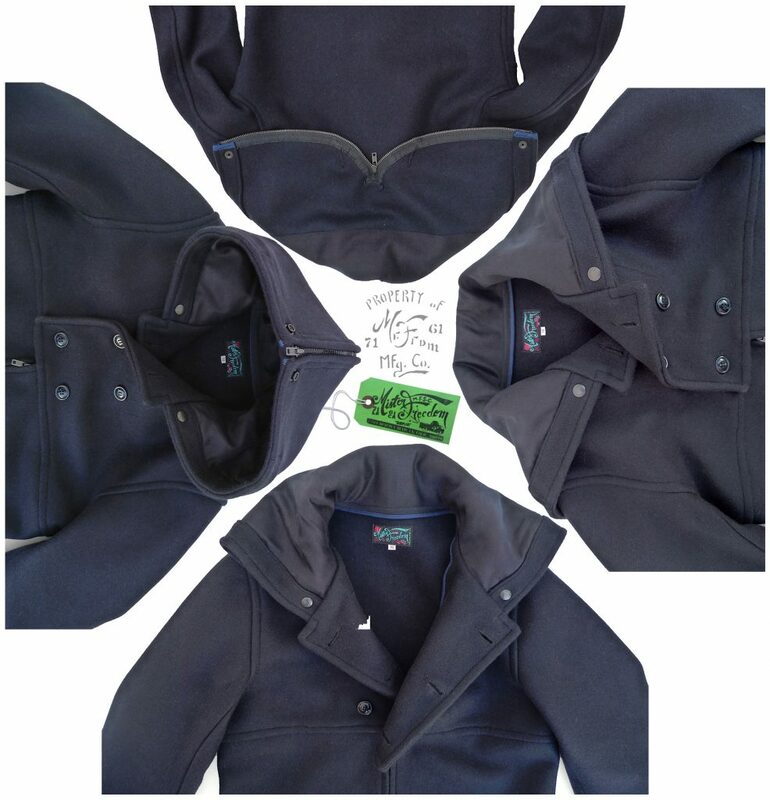 The spark came as we were working on releasing a type of US Naval Academy Midshipmen wool hooded jacket. 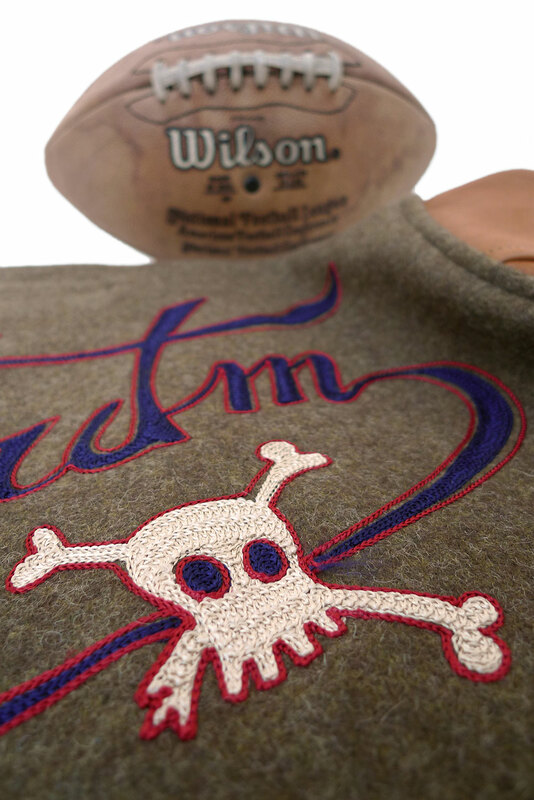 We thought of combining both designs… and there it was, the MF® HUDSON! 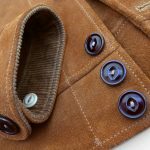 Our jacket pattern has a modern, elaborate and elegant feel to it, but is a lift of what was essentially a well-thought and functioning outdoor garment. 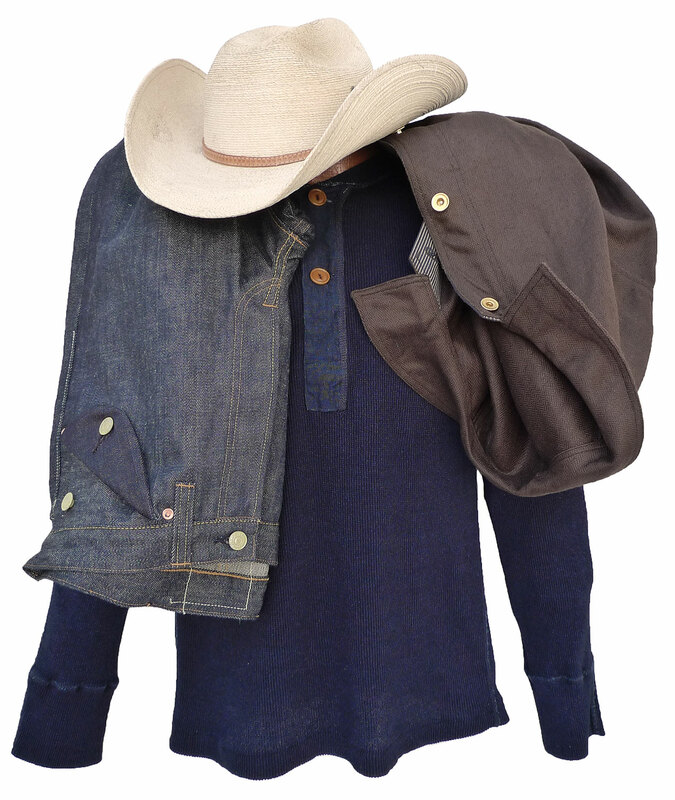 While working in the field, the double-breasted top-half of the jacket buttons-up to keep the chest and neck protected from wind and cold, while the bottom-half zips up and down to allow access to the pockets of an inner (denim or else) jacket. 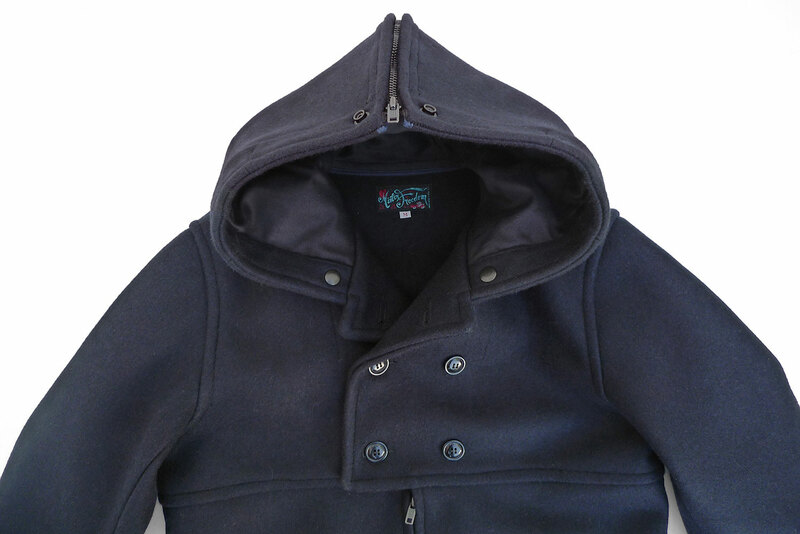 The split-pattern hood, when not worn to scare the neighbors, unzips to lay flat as an extra layer to protect the shoulders, but also folds in half and snaps-up to the shape of a somewhat regular open collar. 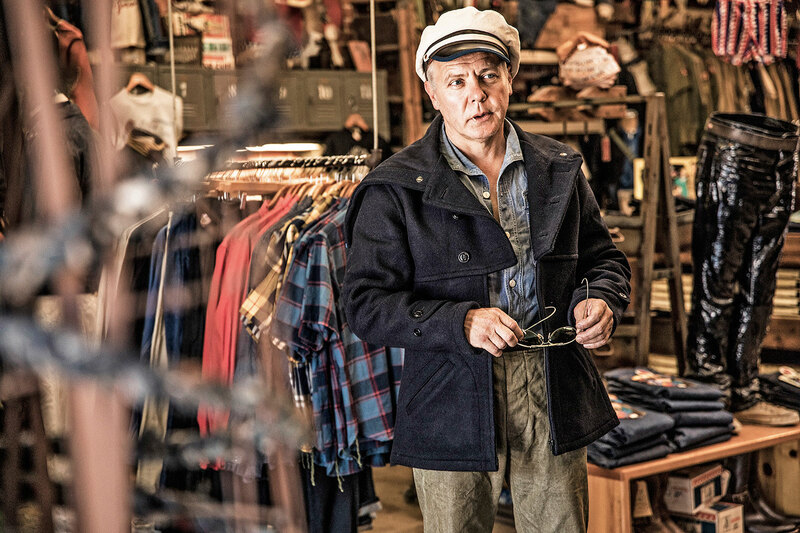 You can style this thing in about as many fashions as you can tie the MF® skipper paréo. We opted for a 36 Oz. 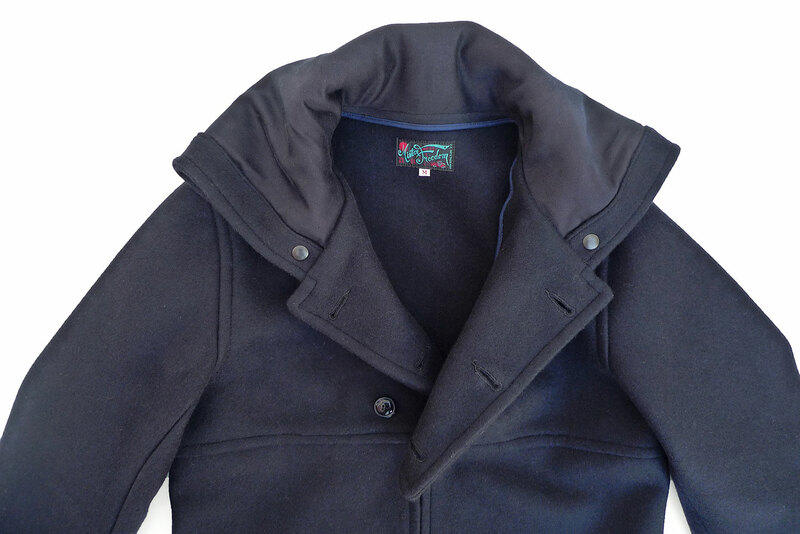 midnight blue Melton wool fabric (the weight of a vintage USN Peacoat), secured from our friend Buzz Rickson’s own coveted stash of vintage mil-specs US Navy trims and textile replicas. 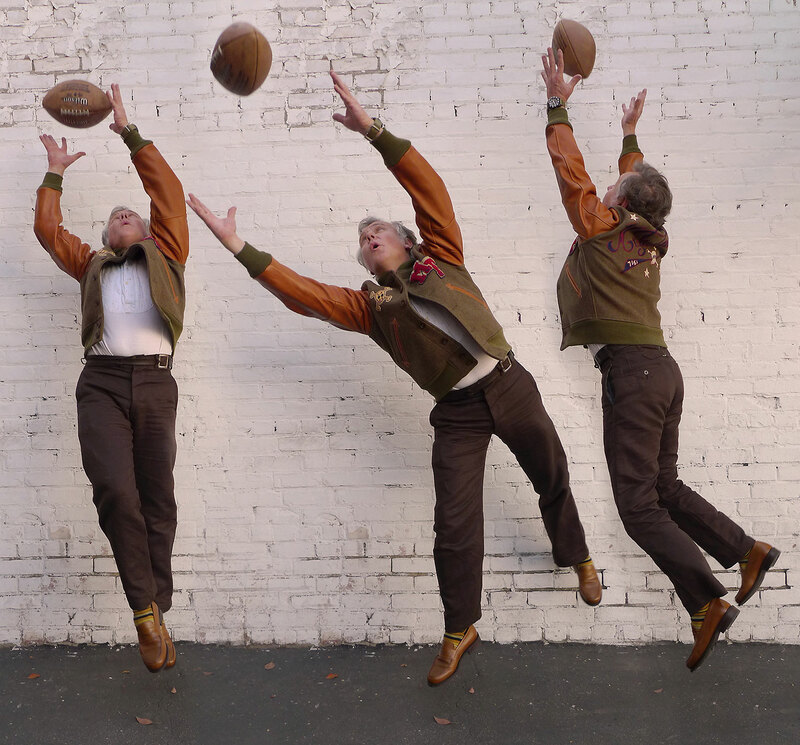 Because of the unlined construction of our HUDSON jacket, we resorted to taped inside seams, a reference to 1930’s sportswear and outdoor jackets, and a nod to early manufacturing savoir-faire. 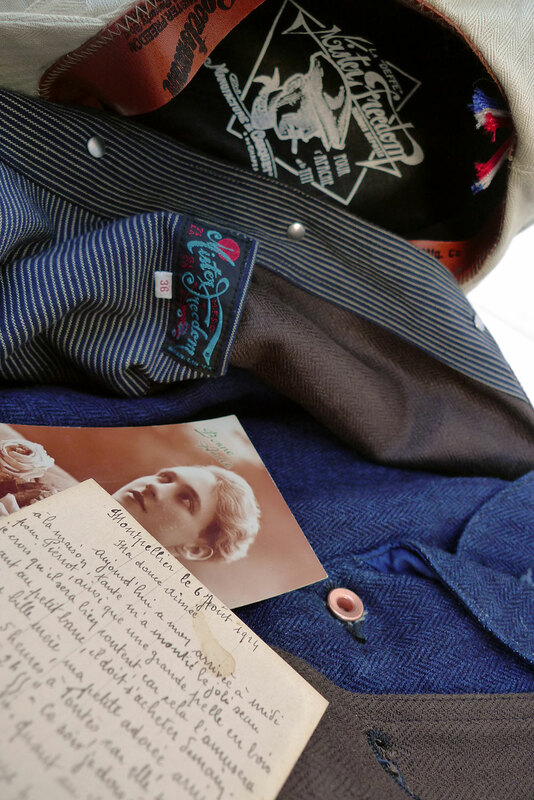 Because we know your inner beauty matters, we graced the seams with indigo-dyed cotton tape of a desirable narrow width, as seen on 1930’s unlined specimen. 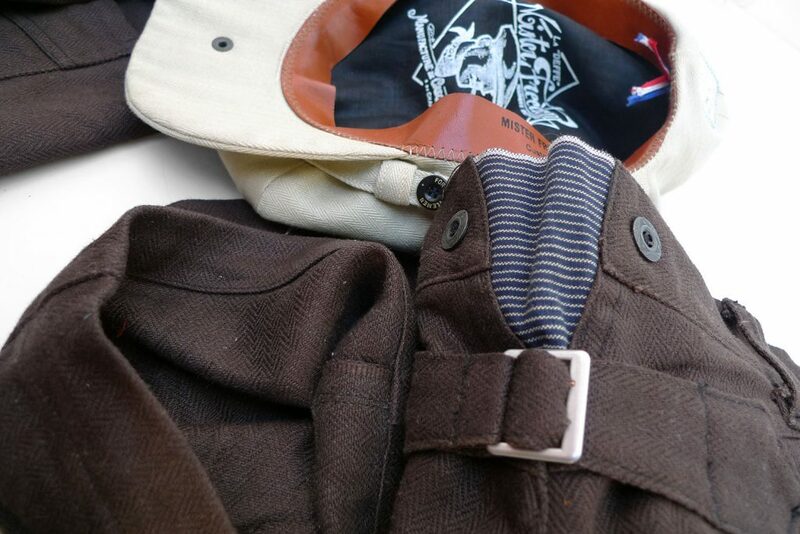 The detail-oriented will also notice that the adjustable wrist cinch tabs are backed with black cotton sateen fabric, a common feature of vintage CPO shirts and old wool garments. 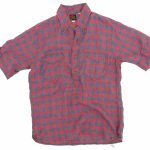 Concerned about your comfort, we also kindly lined part of the collar (the portion in contact with the neck) with a soft-hand NOS cotton sateen fabric. It’s tonal, so you can hardly see it, but those sensitive to wool will appreciate. 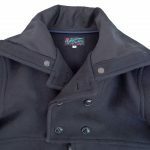 The MF® HUDSON jacket is designed in California by Mister Freedom® and manufactured in Japan by Sugar Cane Co and the expert Toyo Enterprise team. Soft-hand midnight blue 36 Oz. 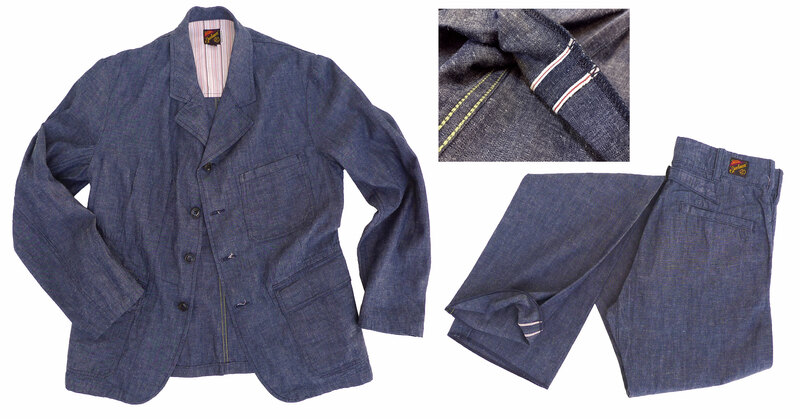 Melton wool, fabric-dyed, vintage mil-specs US Navy type cloth, milled in Japan. 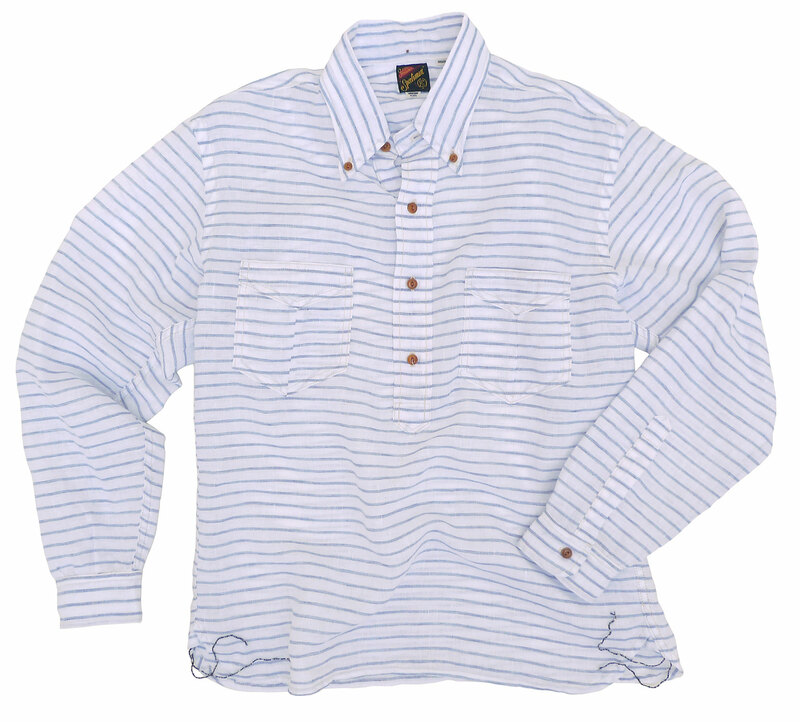 * An original mfsc pattern, inspired by vintage 1930’s unlined outdoor sportcoats and 1960’s USNA Midshipmen jackets. * Unlined body construction featuring attractive taped inside seams, with 1930’s-style narrow-width indigo-dyed cotton tape. * Double-breasted button-up top block and zip-up lower half. * Tonal corozo wood buttons. 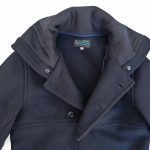 * Versatile collar pattern design: lays flats on shoulders, zip-up as a hood, folds in half and snaps-up to the shape of a regular open collar. * Vintage NOS cotton-tape “Talon” metal zipper, oxidized black. 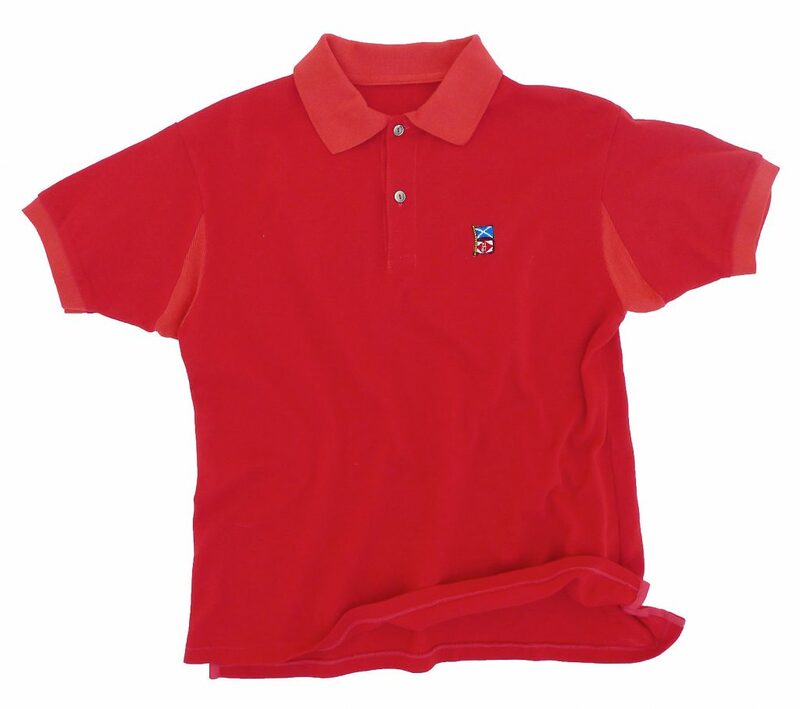 * Neck collar area partly-lined with soft tonal NOS cotton sateen fabric. 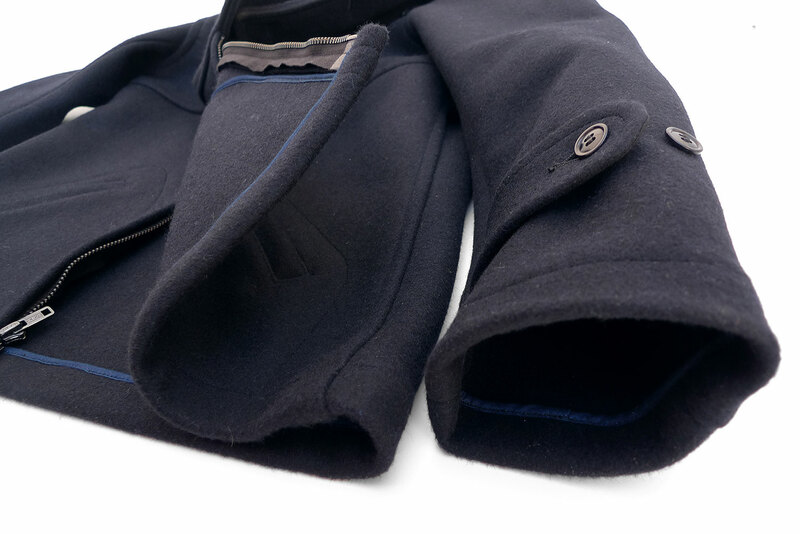 * Adjustable cinch tabs on wrists, backed with black cotton sateen fabric. 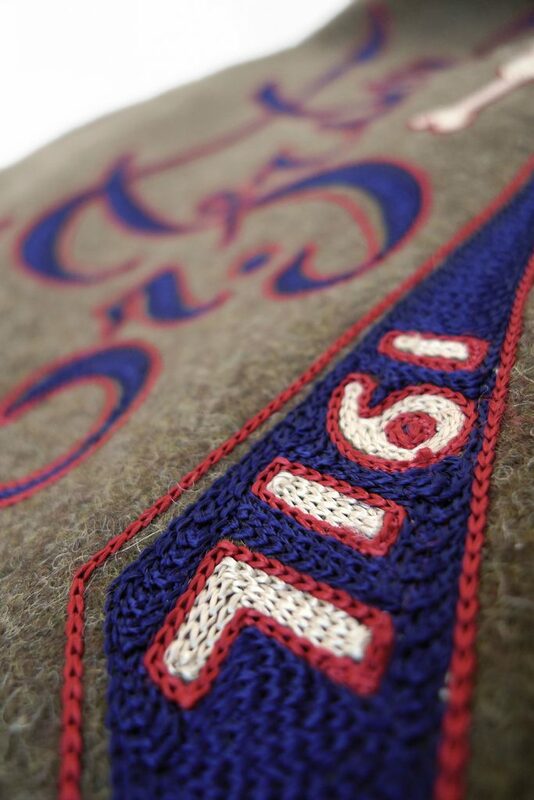 * Woven mfsc Surplus label. 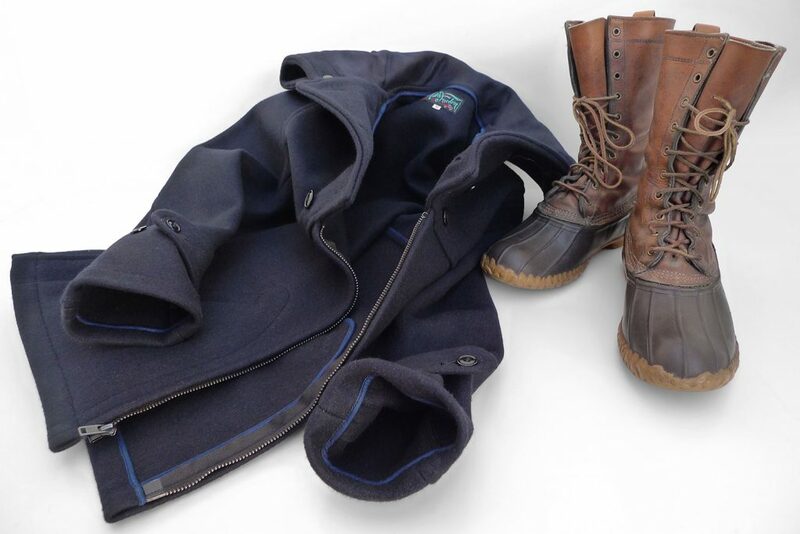 The MF® HUDSON jacket is ready-to-wear, and does not require any special process before use. It is true-to-size, and somewhat intended as a top layer. 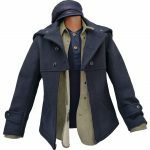 I opted for a size Medium, my usual size in mfsc jackets, for a comfortable fit that will allow wearing a denim (or the like) jacket underneath. Please refer to sizing chart for approximate measurements, to figure which size will work for you. 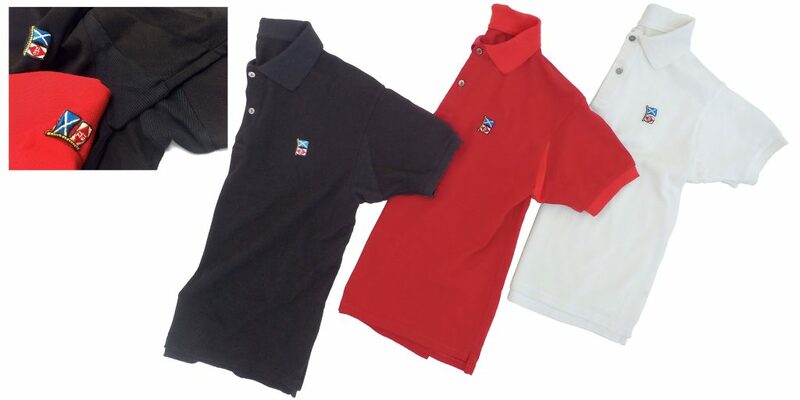 Professional dry-clean only, from your local eco-friendly facility. 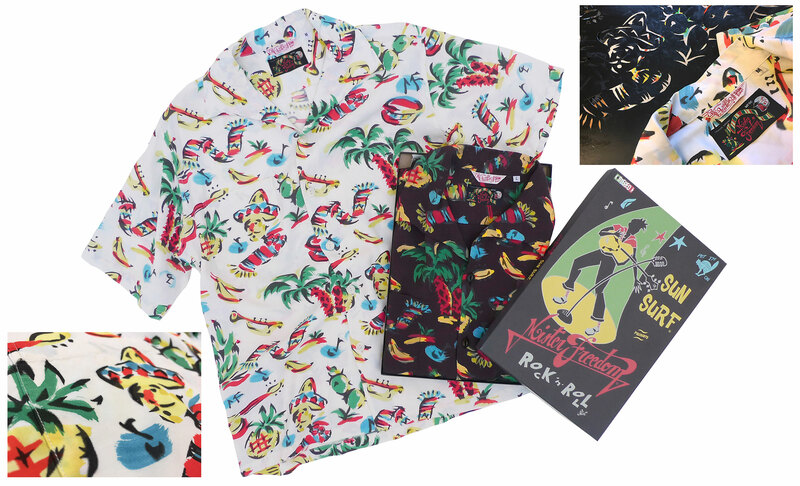 Available from www.misterfreedom.com, our funky-fresh Los Angeles HQ, and fine retailers around the World. 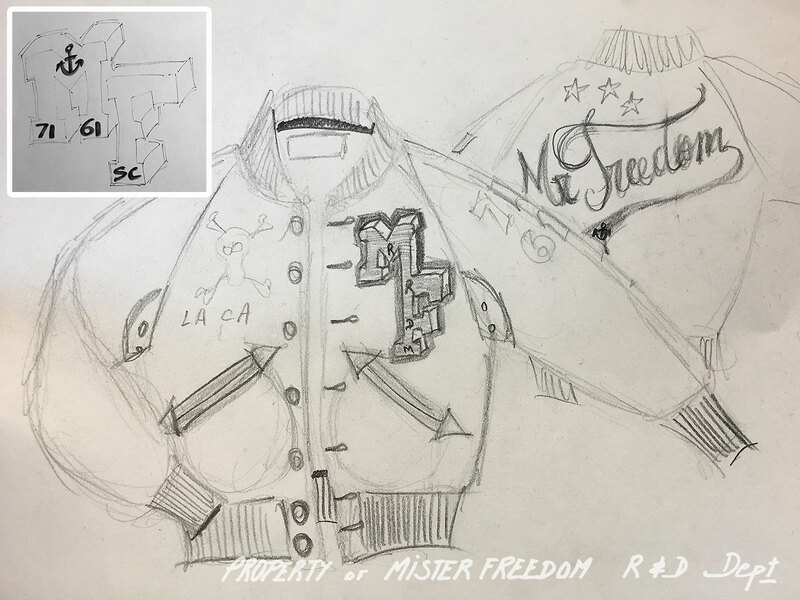 Mister Freedom® “HEADQUARTERS” Jacket, Yarn-Dyed Wool & Horsehide leather, mfsc Surplus FW 2018, Made in Japan. 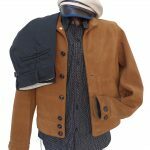 Mister Freedom® HEADQUARTERS Jacket, Yarn-dyed wool & Horsehide leather. Call them varsity jackets, letterman jackets, award jackets, baseball jackets… or “teddy” as they are referred to in France, here is the Mister Freedom® twist on this all-American classic. 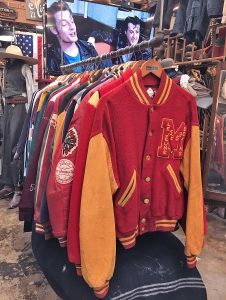 The tradition of outfitting meriting high school and college students with a lettered garment appears to be historically anchored in Harvard’s original baseball team of 1865… Apparently, the ritual of customizing one’s sport sweater with the varsity’s emblem and school colors extended to wool or leather-sleeved jackets sometime in the 1930’s. 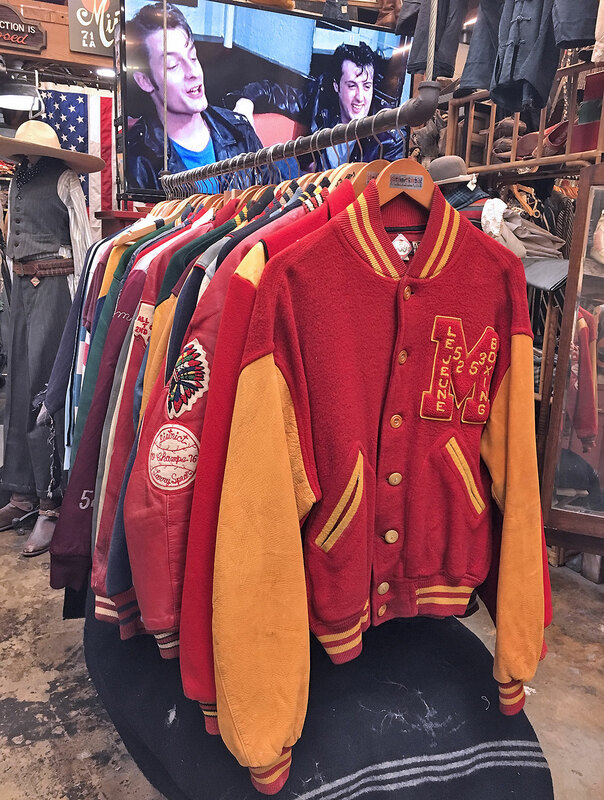 American letterman jackets have gone through a few style variations though the years, raglan sleeves, all-wool bodies, hoods for the ladies, …, but the characteristic chenille and felt letter patches have always remained, and are today a staple of vintage Americana. 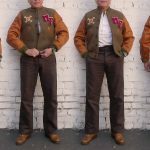 The trademark contrasting leather sleeves of the classic models have gone through a questionable vinyl period in the 1980’s, as the rack of used letterman jackets of your local vintage store will attest to. 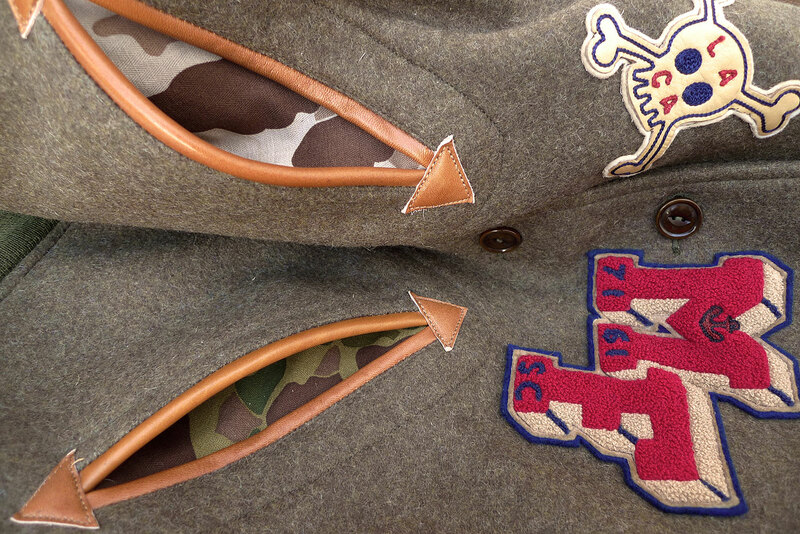 There is indeed a military vibe to our “Club House” jacket, aka MF® HEADQUARTERS jacket. 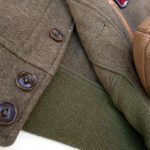 Probably due to the choice of the olive green yarn-dyed body, a hefty wool fabric found on vintage US Army coats, matched by 1940’s tanker jacket olive green knit cuffs and collar, all borrowed from Buzz Rickson’s outstanding mil-specs trim ressources. 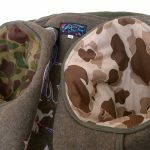 Buzz also supplied the HBT cotton “Duck Hunter” M1942 reversible camo (aka “Frogskin”) we lined the horsehide leather sleeves with. 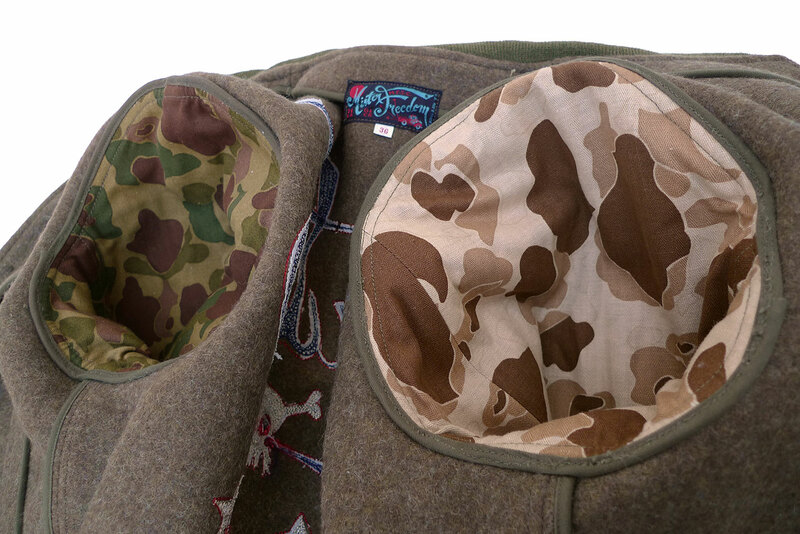 The slash pockets are also intricately lined with frogskin, subtly displaying both jungle/beach contrasting camo sides, a pattern-making and tailoring prowess if you look at how it’s constructed. 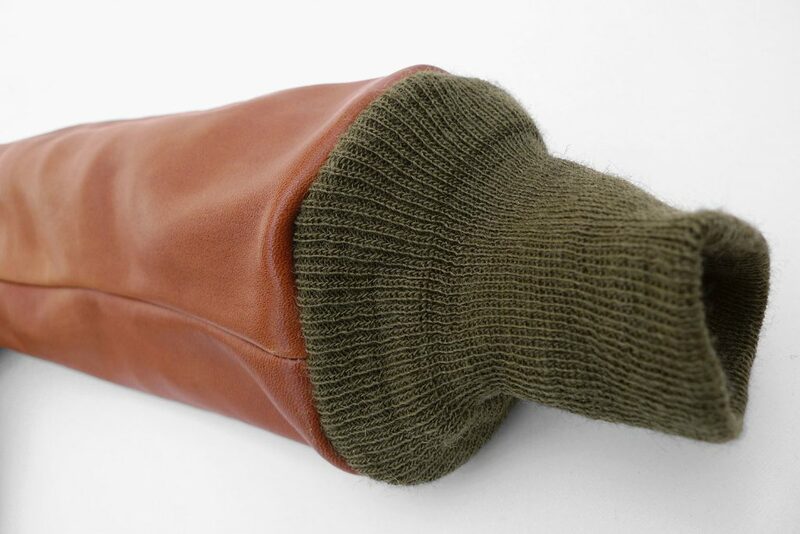 The pocket openings are trimmed with the same cognac brown-colored horsehide leather that pairs so-well with the olive green wool, a color combination we’ve always found attractive. 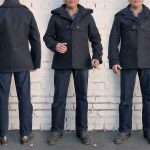 We opted for an early baseball jacket pattern, featuring 1930’s-40’s style button-front closure, as opposed to the later, more typical, snap button versions of the 1960’s and 70’s. The choice of unlined construction with impeccably-taped seams is also a reference to early sportswear and outdoor jackets, and old-school manufacturing savoir-faire. 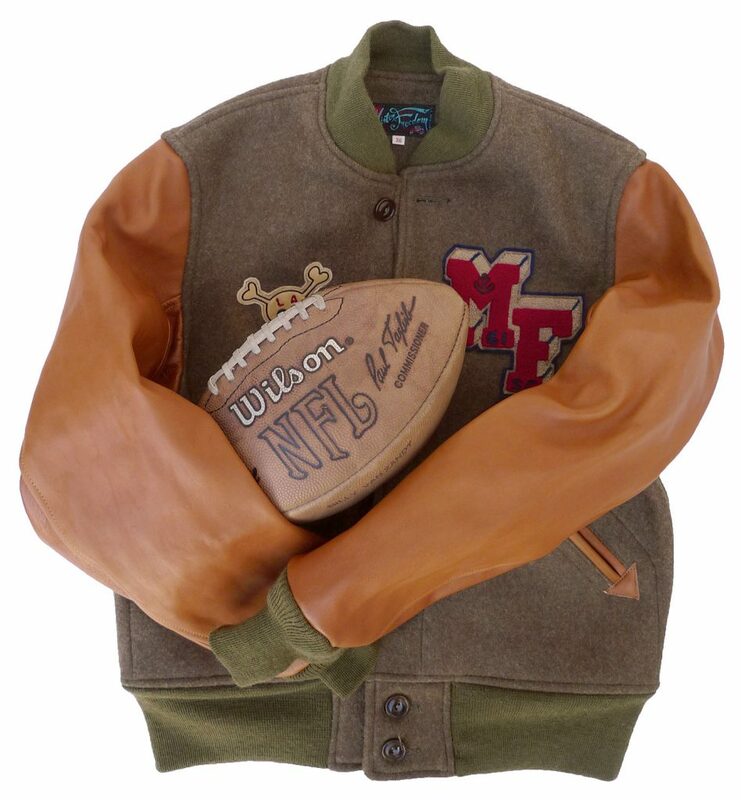 For the custom MF® HQ “branding” treatment, we reached out to Toyo Enterprise’s renown Whitesville label and its varsity-related manufacturing expertise to produce authentic-looking chenille patches, done the old-fashion way. 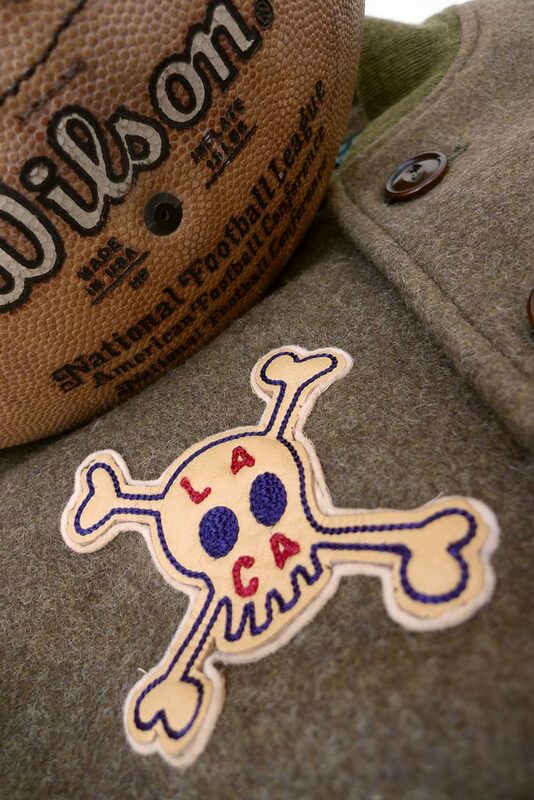 We stayed pretty conservative with the M & F letters design, but the chainstitched leather skull on felt chest patch is quite a rare combination on vintage letterman jackets. 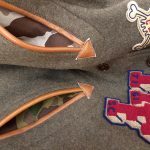 The back of our clubhouse jacket features an irresistible MF® script all-star chainstitch job, as extra eye crack and immediate conversation-starter while in line at the DMV. 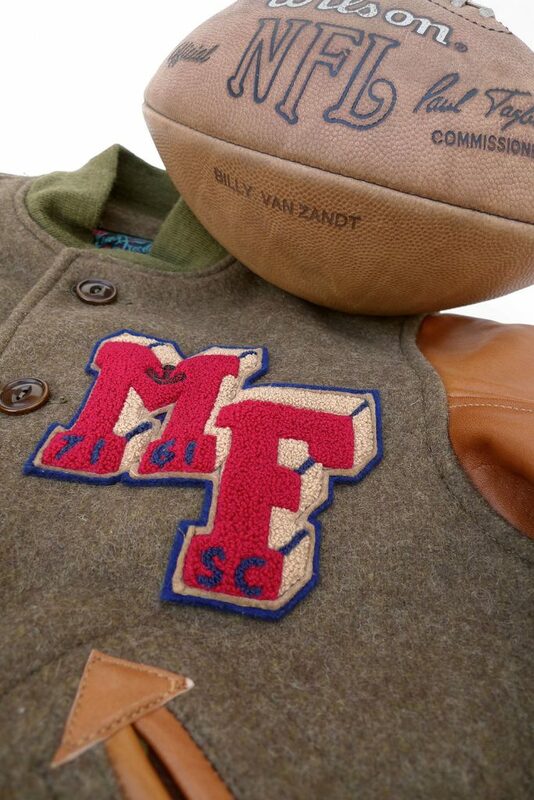 * An original mfsc pattern inspired by vintage varsity jackets and early baseball-type jackets. * Unlined body construction featuring attractive taped inside seams, with 1930’s-style narrow-width olive green cotton tape. 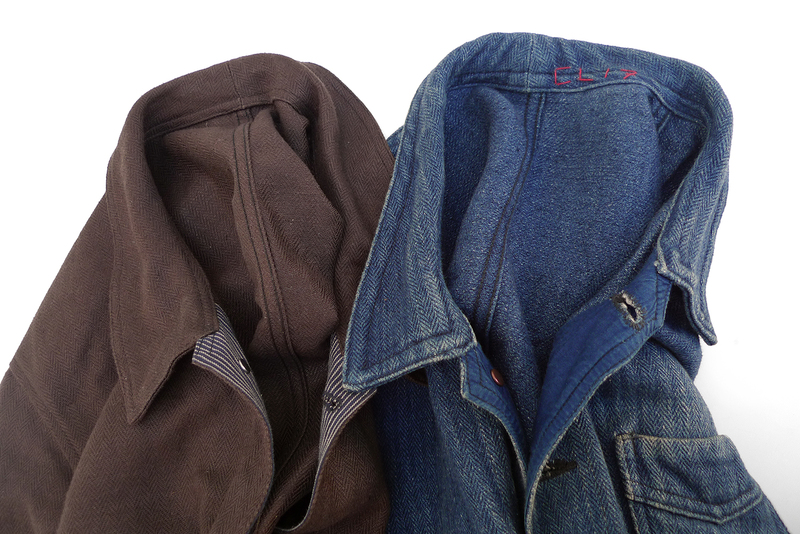 The MF® HEADQUARTERS jacket comes unwashed, and should stay that way. 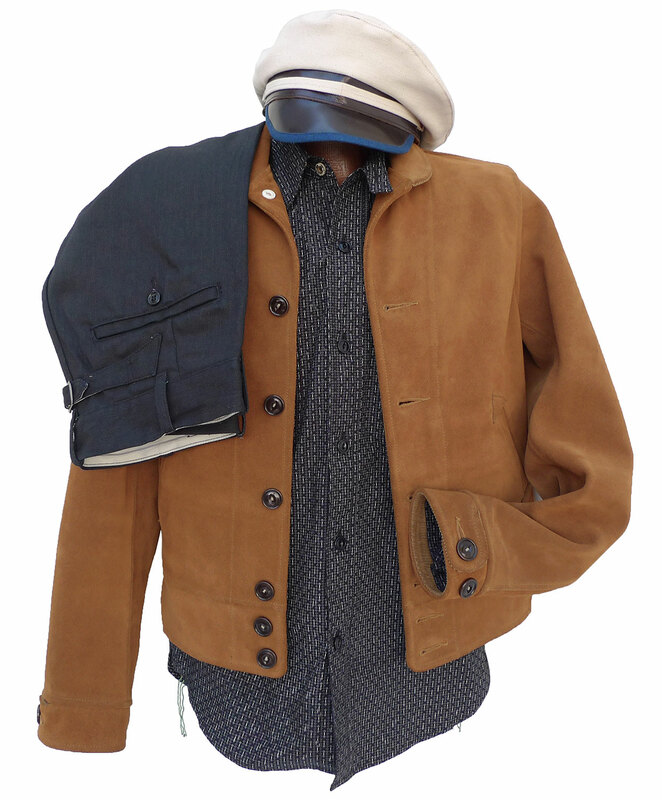 The jacket is ready-to-wear as-is, without any initial protocol. For those familiar with it, the sizing is that of Toyo’s Whitesville stadium jackets. I opted for a size 36 for a trim, balanced fit. The size 38 looked a bit too ‘contemporary’ on me, for my own taste. 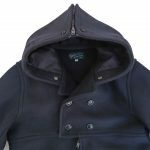 Do not attend to have the whole jacket laundered or dry-cleaned, even from a place that claims to specialize in leather garments. 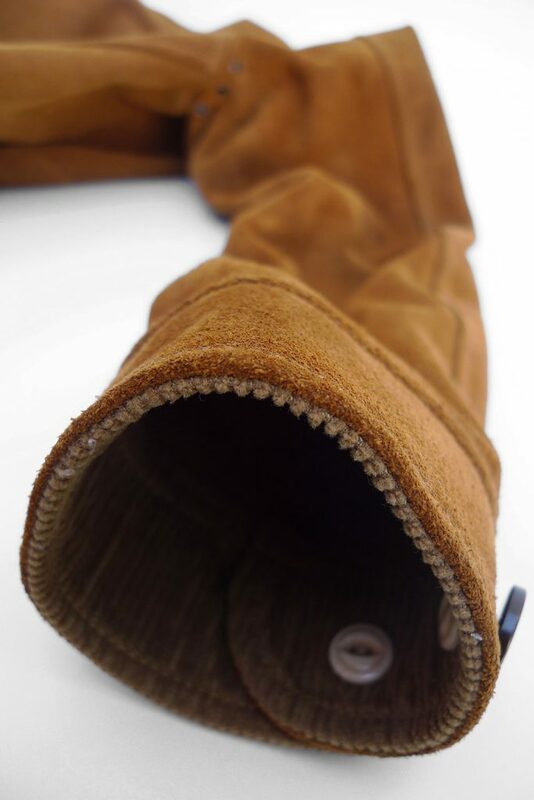 The leather horsehide sleeves can be conditioned after years of wear and exposure to the elements, using professional leather conditioners made for garments (not shoes), such as Pecard products. 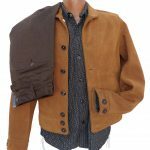 An attractive natural patina will develop on the sleeves, filled with nicks, stains and character typical of well-worn quality leather garments. 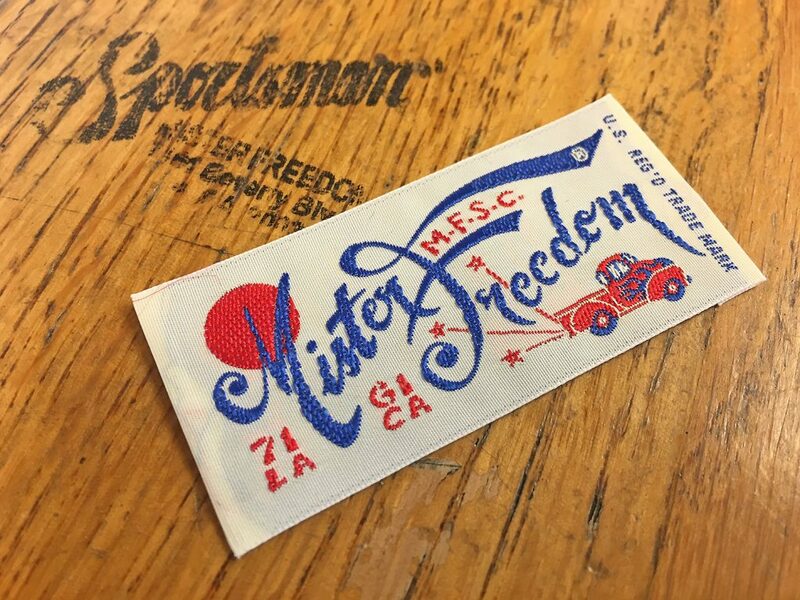 Available from www.misterfreedom.com, our Los Angeles HQ of course, and fine retailers around the World. 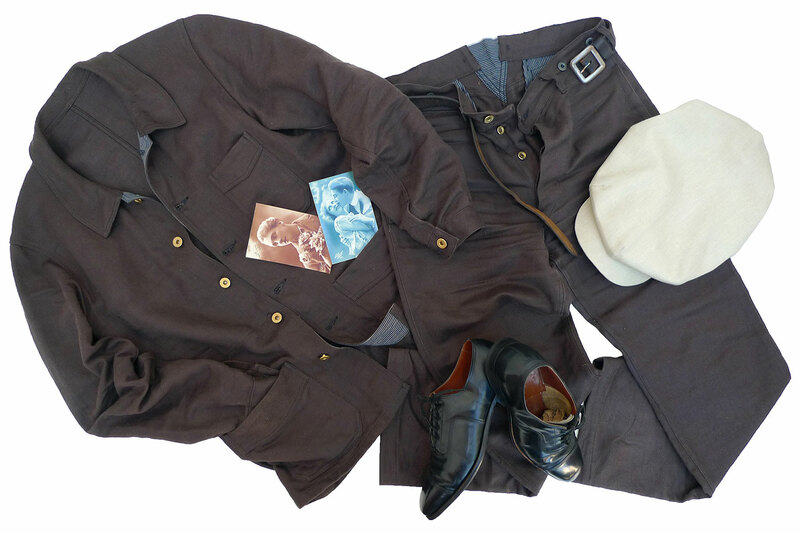 Mister Freedom® “Veste BELLEVILLE” & “Pantalon CAMARGUAIS”, mocha HBT linen/cotton. 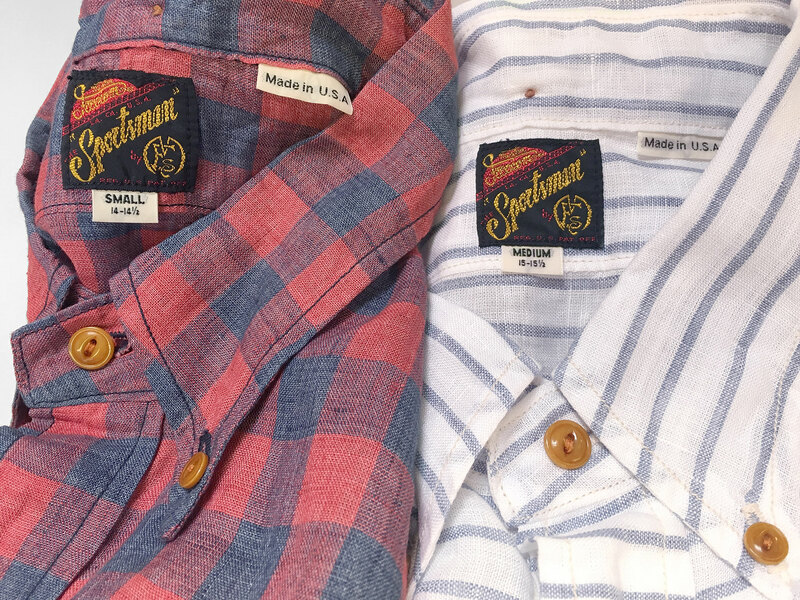 We are adding a French twist to the MF® “Surplus” mfsc catalog this season, in the form of two vintage-inspired design classics lifted from the Old World. The top piece, a classic pattern we reinterpreted and chose to call Veste Belleville, is a style familiar to most today, as it has made it into international streetwear for years. Many modern fashionable versions exist. 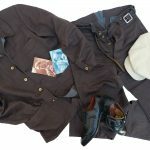 It is mostly known as the French work jacket, and often referred to as ‘bleu de travail’ (work blues) in its homeland. 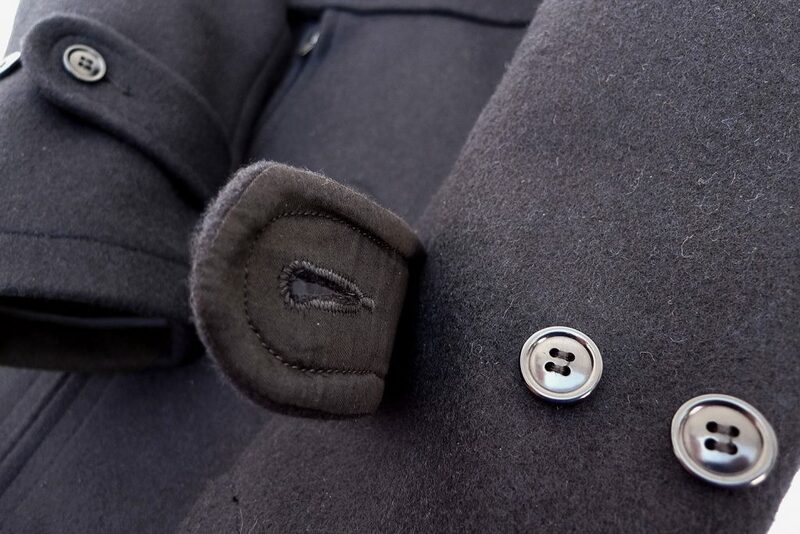 Our interpretation features the typical two-piece spliced collar, a staple of these French workwear chore coats. 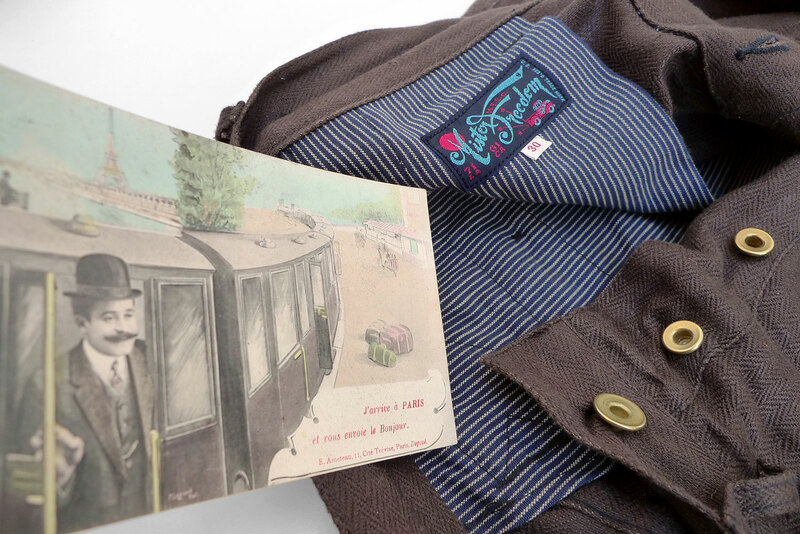 Our Veste Belleville was introduced during the swinging days of our Gypsy Blues escapade, and issued at the time in a covert woven stripe twill, and in a foxy indigo-dyed HBT linen/cotton blend version. 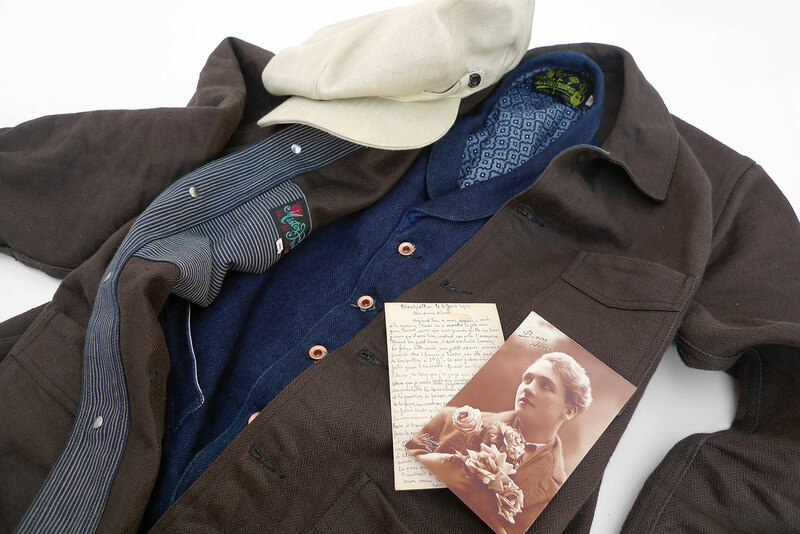 That herringbone twill was inspired by vintage French firemen uniforms of the 1900’s. 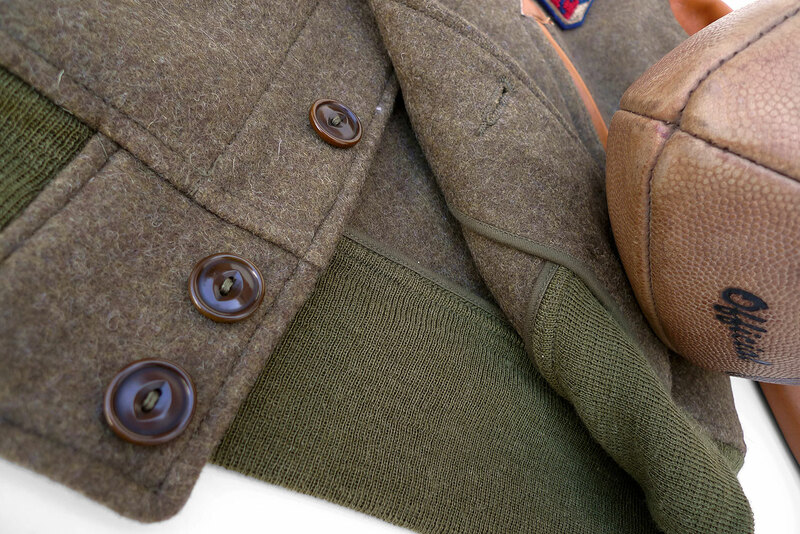 The few rare antique specimen that have survived today are sought-after treasures for designers and militaria collectors alike, both the indigo and black/dark brown versions. Below, our friend Jérome Girard, aka “J” or “Le Zouave”, fiercely models a 1900’s French Fireman tunic, an authentic early model with an impressive indigo patina. The ‘Nam boonie hat is a nice touch. Photo stolen from J’s epic IG feed. 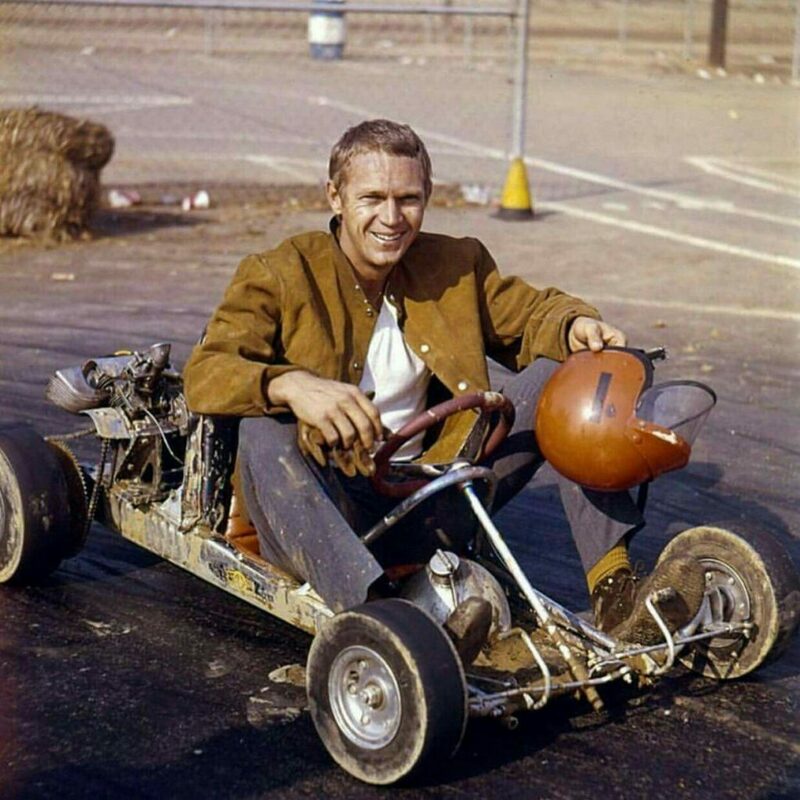 What a mug, what a legend! Magnifique! In its un-dyed, loomstate form, our 80% linen-20% cotton blend HBT fabric comes in a natural un-bleached ivory color. 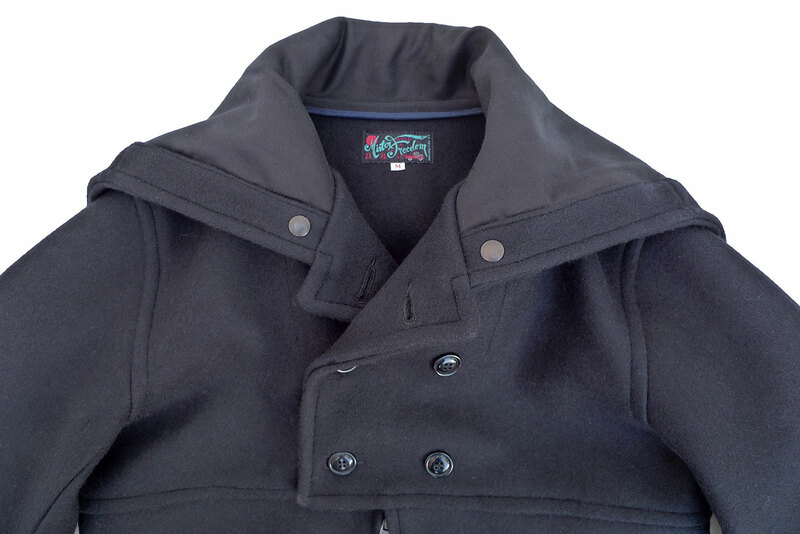 It has been featured loomstate on the MF® Waterfront Coat released in 2016. 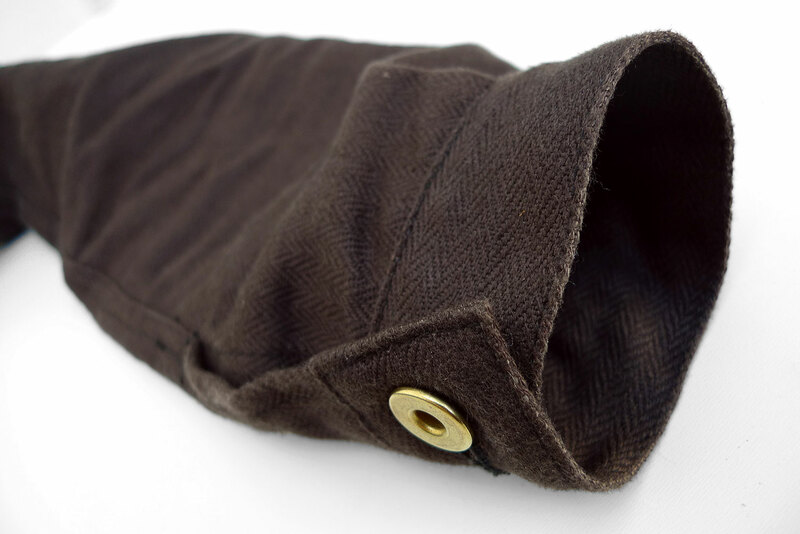 This season, we decided to offer the same textile in a rich and warm dark brown “mocha” color. Because of the specific method of fabric-dyeing we opted for, the core of the yarn keeps its original off-white color, a telltale of future attractive patina. Now the pants. 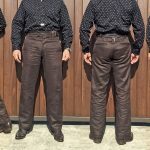 The bottom piece is also a classic European garment pattern we reinterpreted, a traditional 1900’s-1930’s style of French work pants popular with farmers and laborers. We decided to name this pattern “Pantalon Camarguais” because of the twist we put on it. Pronounced KA-MAR-GAY (the u is silent), the adjective is a reference to a French region called Camargue. For those unfamiliar with this beautiful corner of the world, we mentioned it briefly while introducing the Gilet Gadjo of the 2017 Gypsy Blues collection. 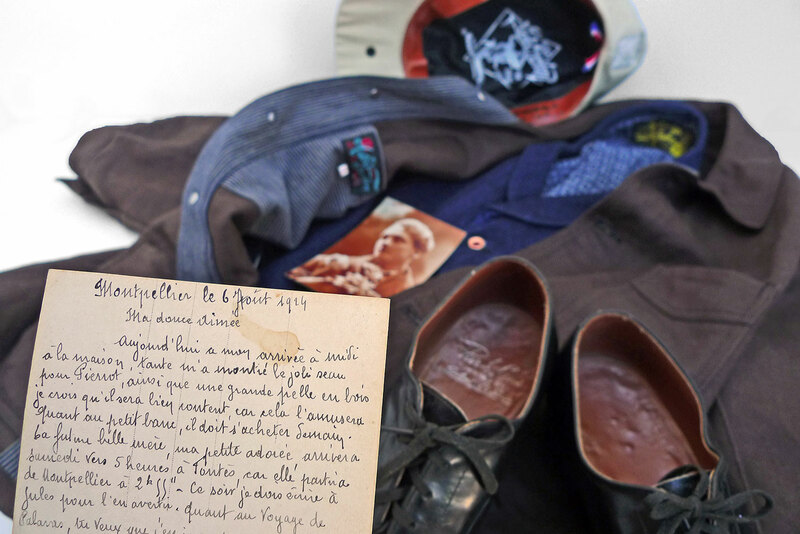 “ … If black and navy blue are typical colors of old-school French workwear, brown and cream moleskin garments were quite popular with the Gardians of Camargue, the gritty Provençal cowboys dreamed-up by the legendary Old-West-obsessed Folco de Baroncelli in the early 1900’s. In the old days, these famed horsemen of the delta of the Rhone, Southern France, typically wore moleskine boot-cut riding pants, with the characteristic contrast piping running down the leg seam. 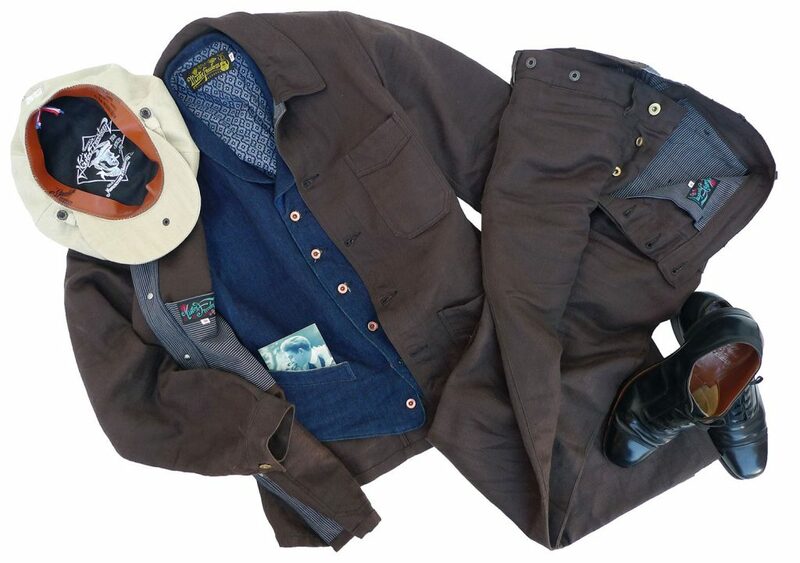 A matching moleskin vest, flamboyant plaid or printed cotton shirt, low-crown western-style hat, and a pair of Camarguaises (local traditional rough-out leather boots) often completed these work outfits. 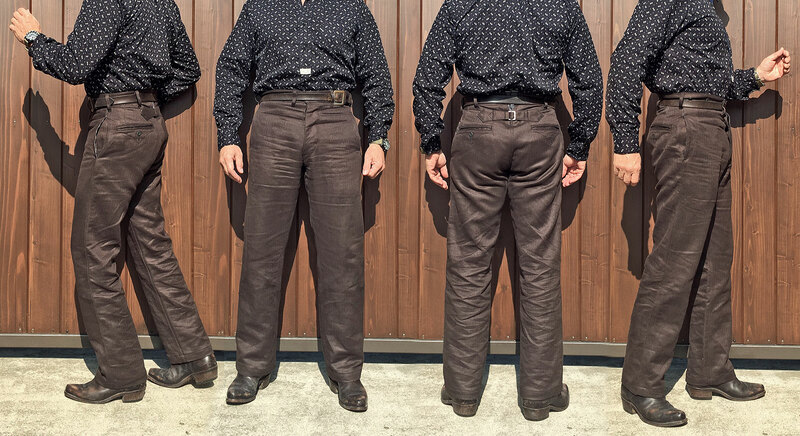 The Provence cowboy connoisseur will note that our “Camarguais” pattern is a blend of vintage style references, but absolutely not a replica of the typical French Gardians’ riding trousers mentioned above. 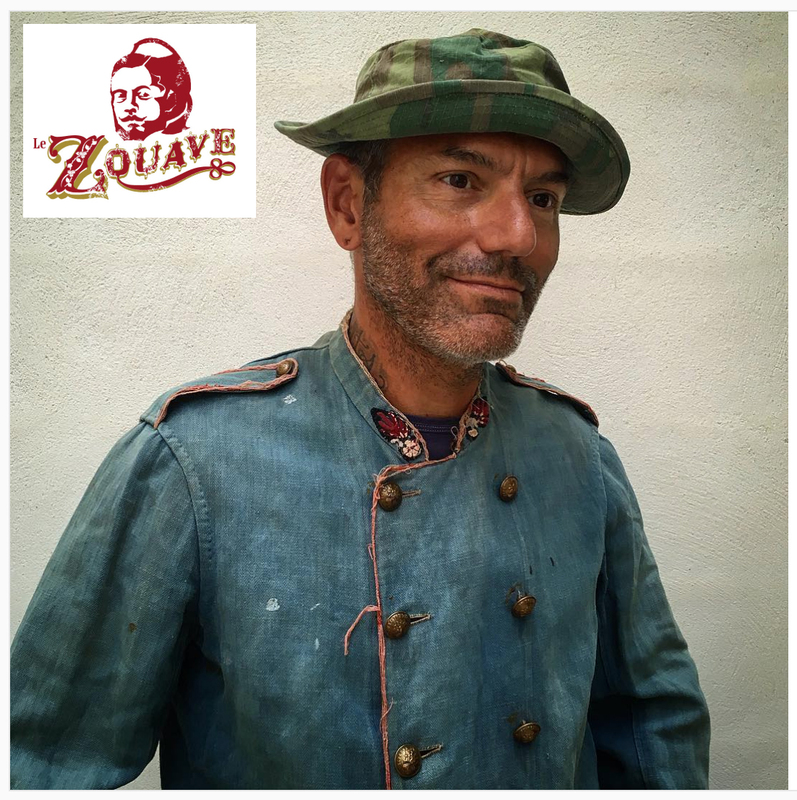 As admirative and respectful of Costume History as we are, we took some liberties with authenticity on this one. 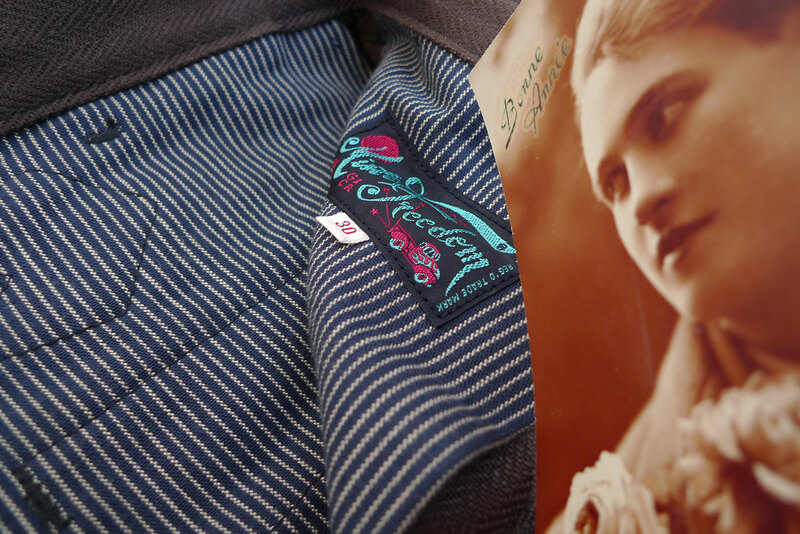 One of our inspirational piece for the project, the vintage super-high-waisted blue moleskine pantalon pictured below, was re-worked into a 21rst Century wearable, sans the charming albeit ill-fitting and costumey vibe of the original. The back rise reaching the shoulder blades is a bit hard to pull-off these days. 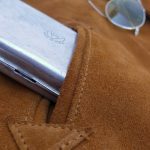 The pocketing we opted for, for both jacket and pants, will look familiar to the ol’ MF® OG: it was featured ages ago on our Pantalon Ouvrier. This sturdy indigo stripe ticking fabric was also inspired by antique French textiles. 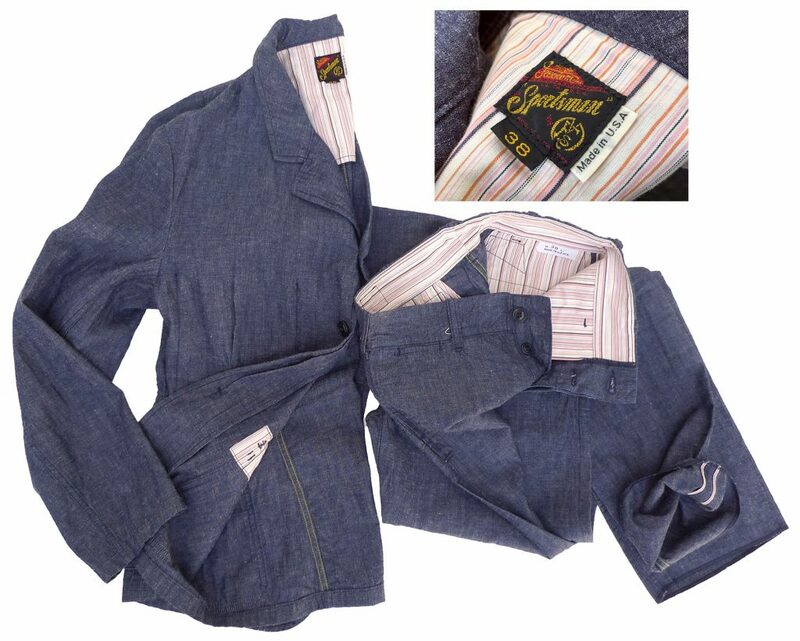 Pair these fine pieces as a set and call it le French leisure suit, or incorporate either for a touch of rugged Old World elegance in your wardrobe, the Veste Belleville and Pantalon Camarguais are now part of the Mister Freedom® SURPLUS collection of international classics, made for the discerning Gentleman of style concerned with ethical manufacturing. 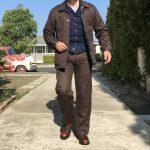 The MF® “Veste BELLEVILLE” & “Pantalon CAMARGUAIS” are designed in California by Mister Freedom® and manufactured in Japan by Sugar Cane Co and the expert Toyo Enterprise team. A fancy 15 Oz. 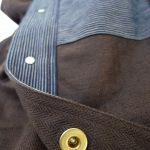 blend of 80% linen and 20% cotton Herringbone Twill (HBT), dyed in small batches in a warm mocha brown color, keeping the core of the yarn natural. 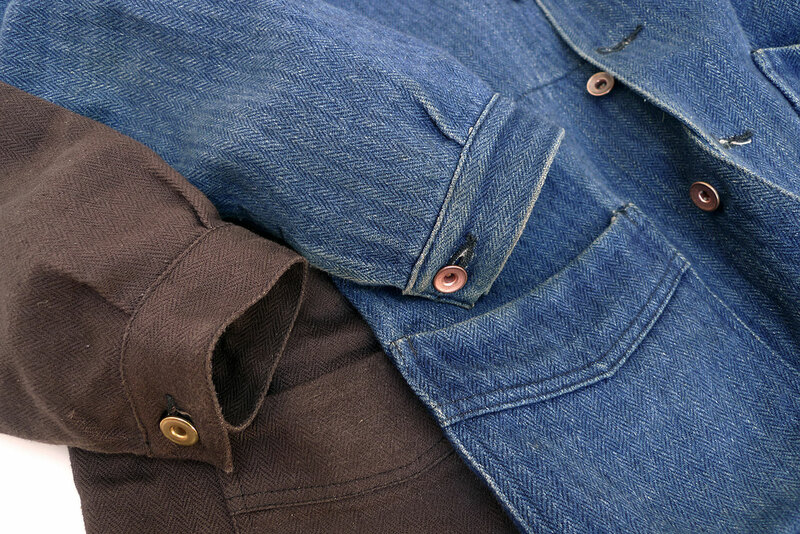 Selvedge fabric, expertly milled and dyed in Japan. 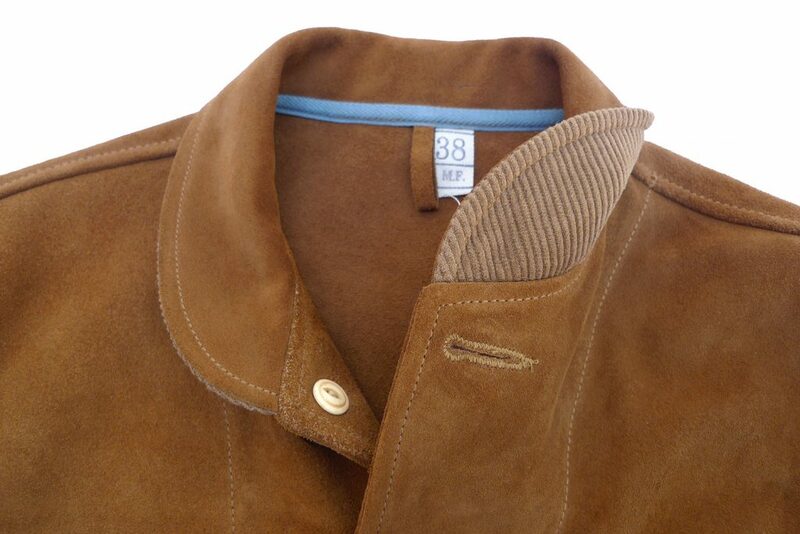 1) MF® Veste BELLEVILLE, mocha HBT. 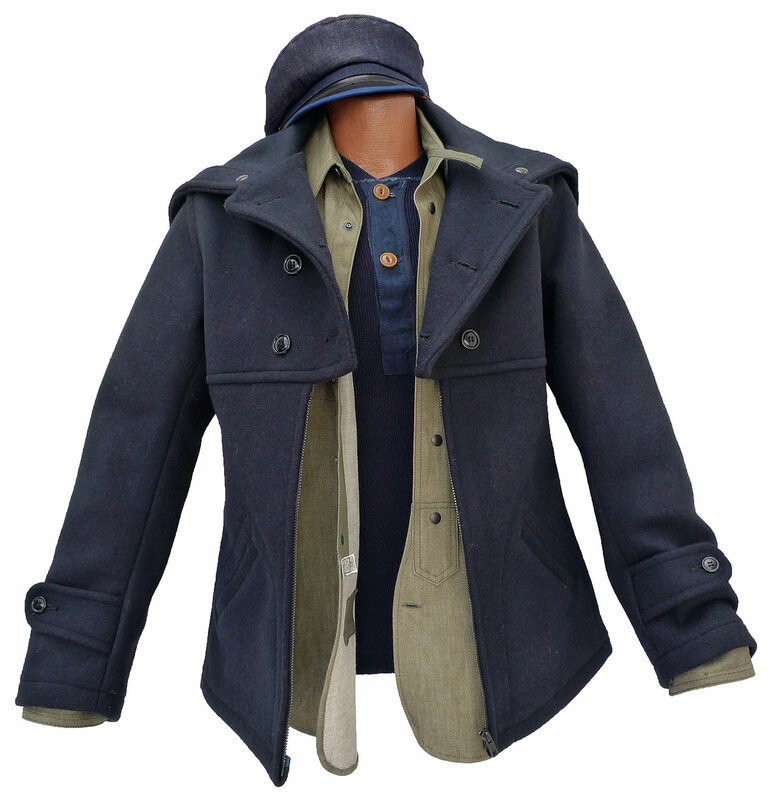 * Inspired by classic 1930’s-40’s traditional French work/farmer jackets. 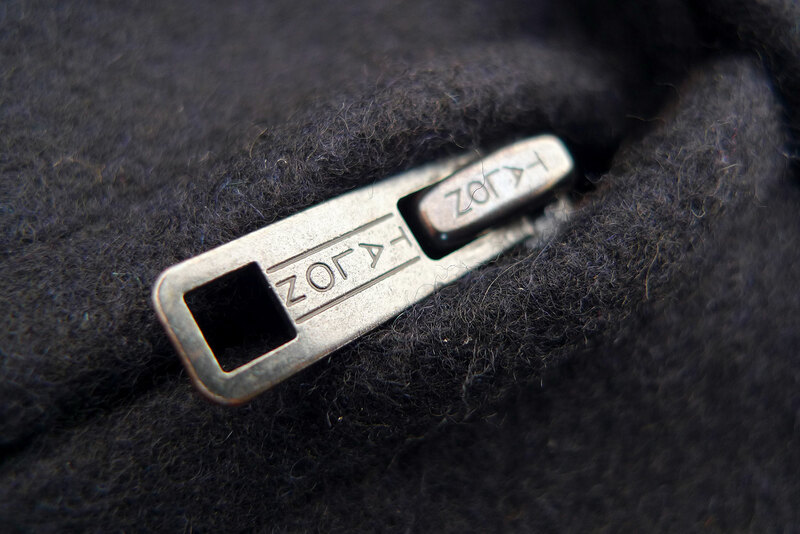 * Utilitarian unmarked ‘donut’ brass metal buttons. * Three outside patch pockets. 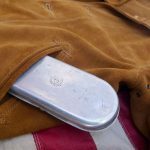 Elongated chest pocket fits some iPhone models. 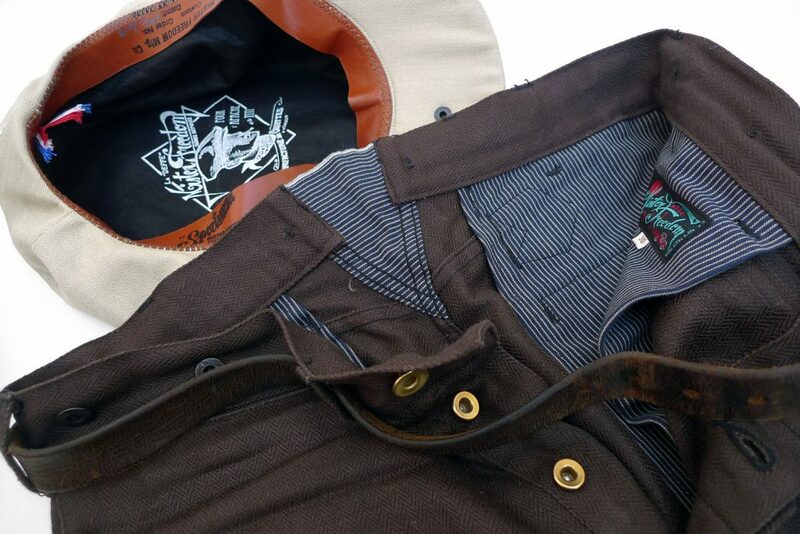 * Concealed chest pocket, featuring the MF® “SURPLUS” woven label. 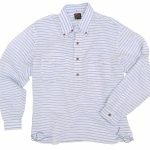 * Contrast indigo stripe ticking button placket facing. * Early tailoring off-set shoulder seam pattern. 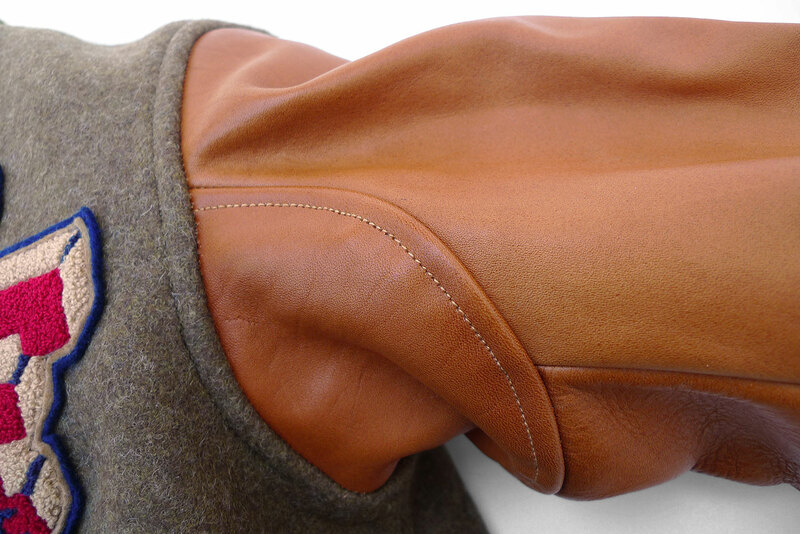 * Flat-felled seam construction, hi-count tonal stitching. 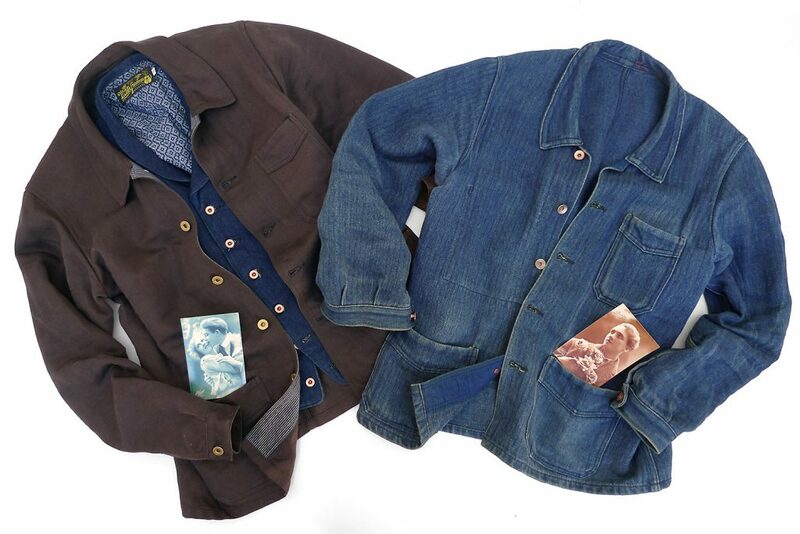 The MF® Veste BELLEVILLE, mocha HBT comes raw/unwashed, and will shrink to tagged size. Follow the usual recommended initial method before wearing: cold soak for 30mn, occasional hand agitation, spin dry and line dry. 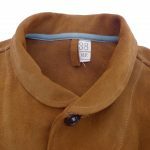 We recommend sizing down on MF® Veste BELLEVILLE in mocha HBT, as we had advised for both the indigo and covert original versions. 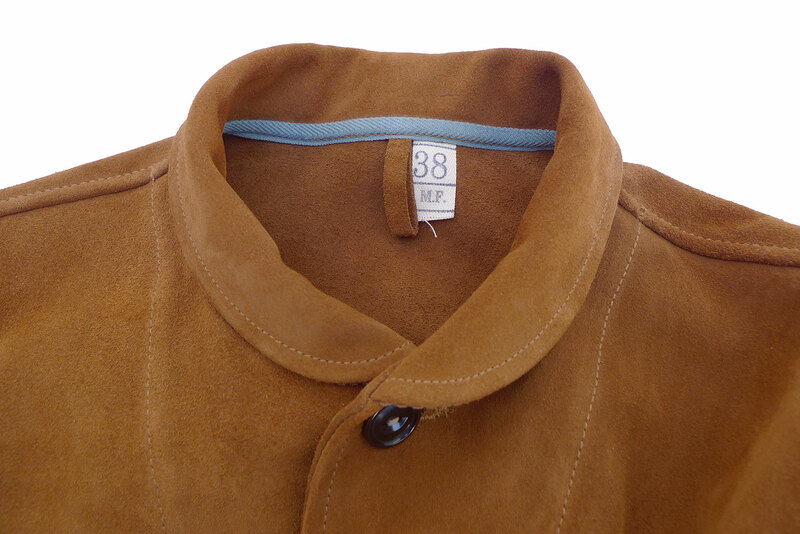 I usually wear 38 (Medium) in mfsc jackets, but went with a 36 (small) with the Belleville, without arm-hole issues. 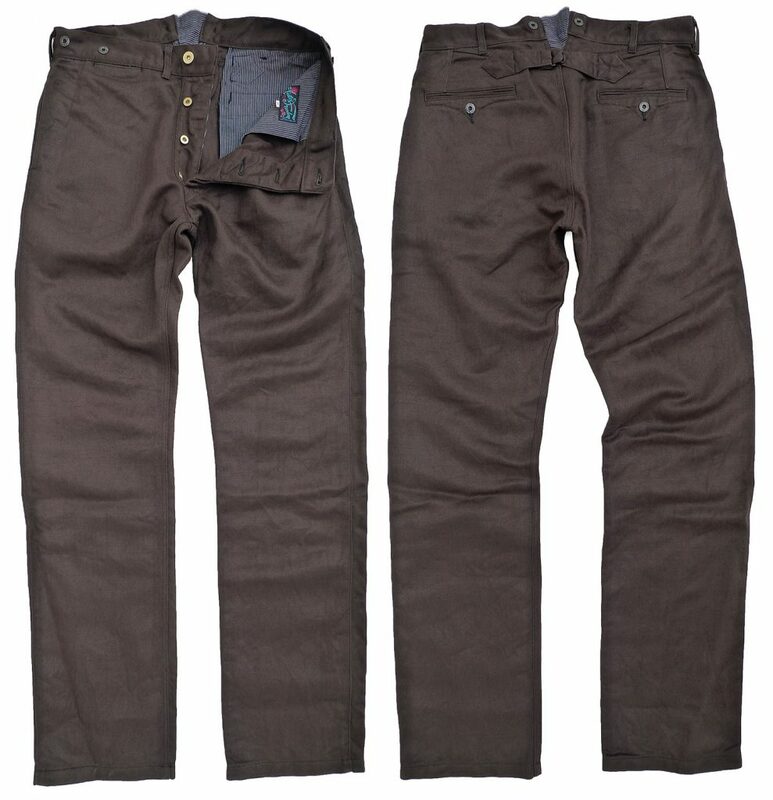 1) MF® Pantalon CAMARGUAIS, mocha HBT. 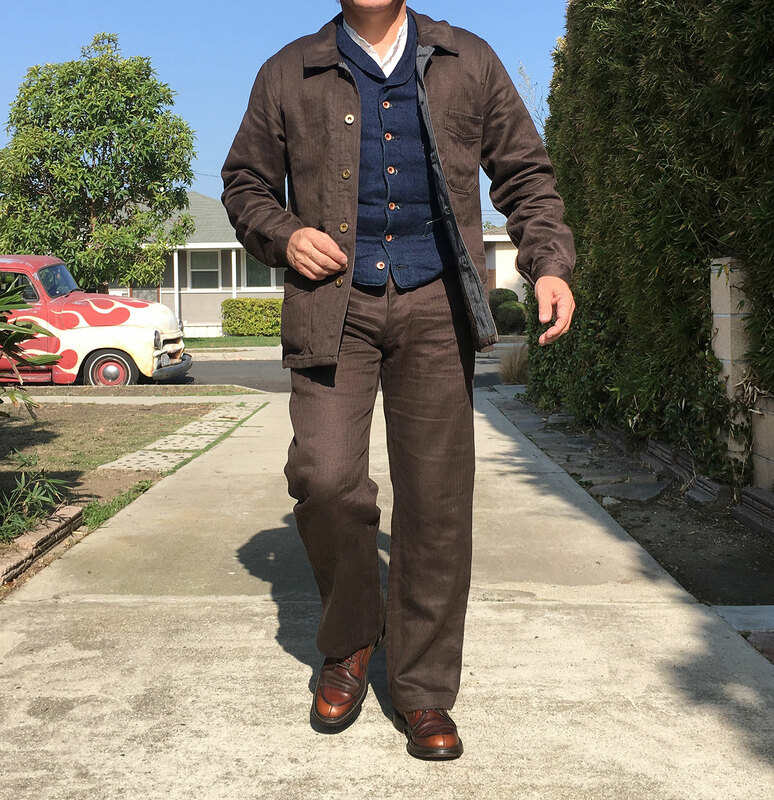 * An original mfsc pattern inspired by vintage French farmer/laborer work pants and 1900’s European trousers. * Cinch-back with vintage-style steel/copper combo sharp prong buckle. 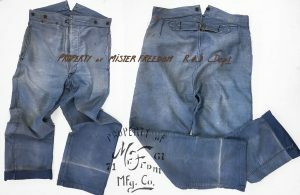 * “French seam” style outseam, featuring the HBT fabric selvedge ID. * Early French trousers style back yoke. 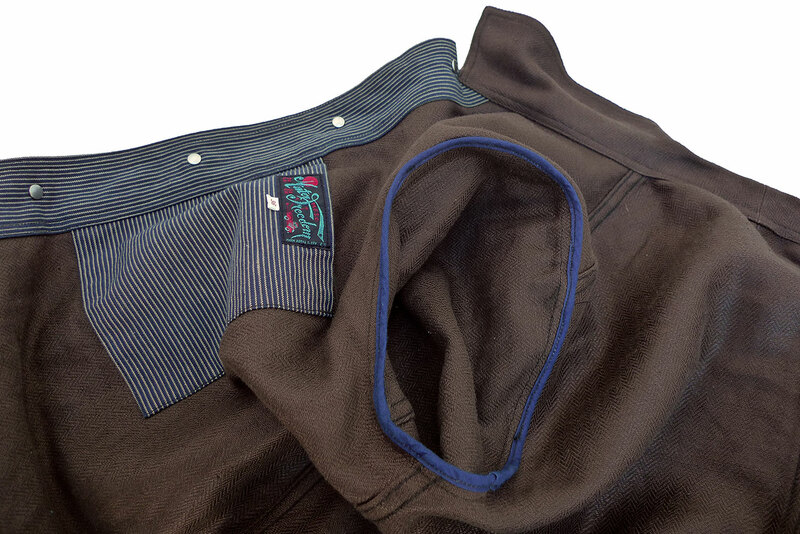 * Rear expansion gusset featuring the indigo ticking pocketing fabric ID selvedge. 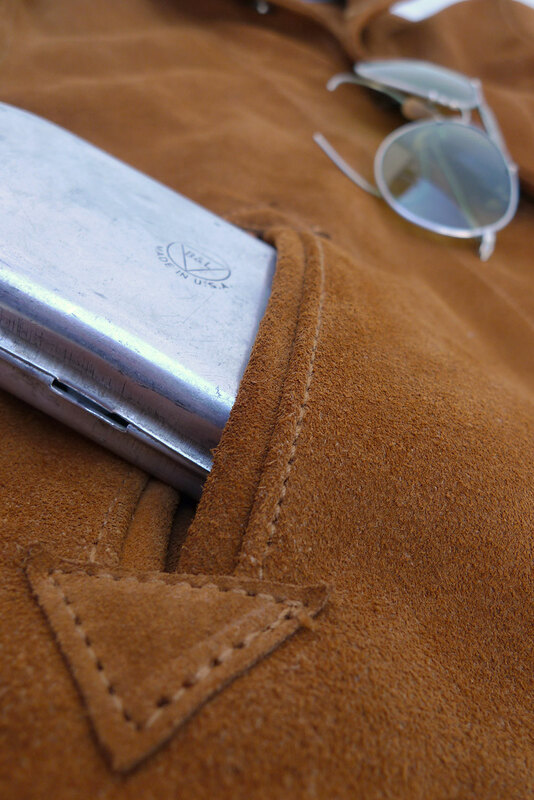 * Arcuate stitch design on pocket openings. 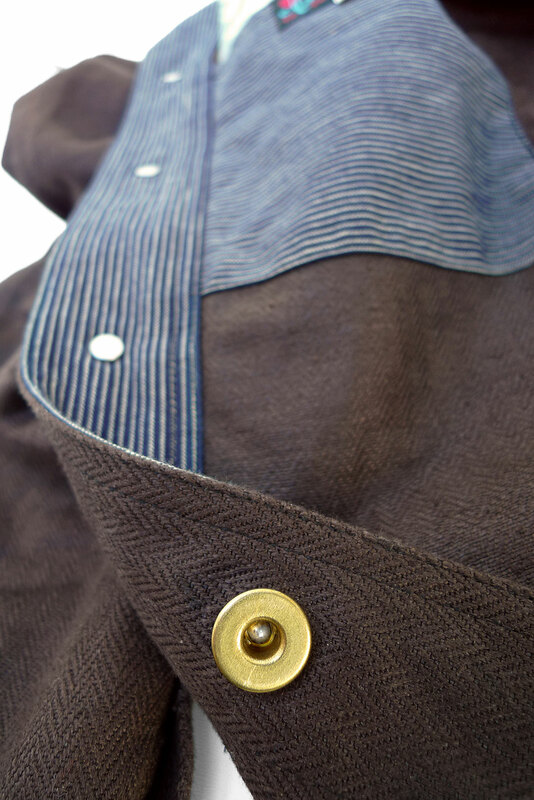 * Rear gusset featuring the indigo ticking pocketing fabric ID selvedge. 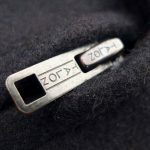 * Art Deco-style sheet metal suspender buttons. The MF® Pantalon Camarguais, mocha HBT comes raw/unwashed, and will shrink to tagged size. These trousers feature a quite generous cut. I opted to size down to a Waist 30, for a slimmer silhouette. Please refer to chart to figure which size works for you. Hand wash or machine wash on delicate, cold water, minimal eco-friendly detergent. Turn inside-out to avoid marbling of the fabric. Line dry ONLY. 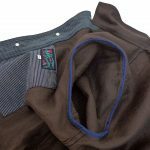 This fabric will develop attractive patina overtime, according to the owner’s activities, frequency of wear and laundering choices. 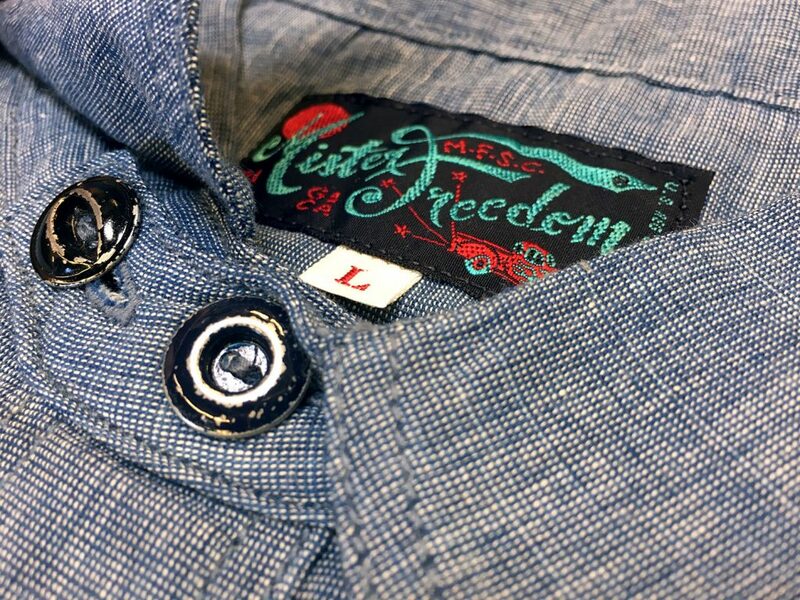 Available from www.misterfreedom.com, our Los Angeles HQ, and fine retailers around the World. 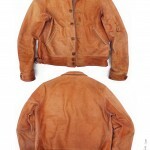 Mister Freedom® “JOHNNY” Campus jacket, cognac suede cattlehide, Made in USA. 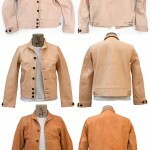 Mister Freedom® “JOHNNY” Campus jacket, cognac suede cattlehide. Fall 2018 mfsc Sportsman catalog. Our popular MF® Campus pattern is back this Fall, this time in a vibrant suede cow-split leather. For those who wonder, the name is a quaint reference to the 1991 flick “Johnny Suede”, which I watched some twenty-five years ago, and can’t remember the first thing about, besides the catchy title and Brad Pitt’s big hair. 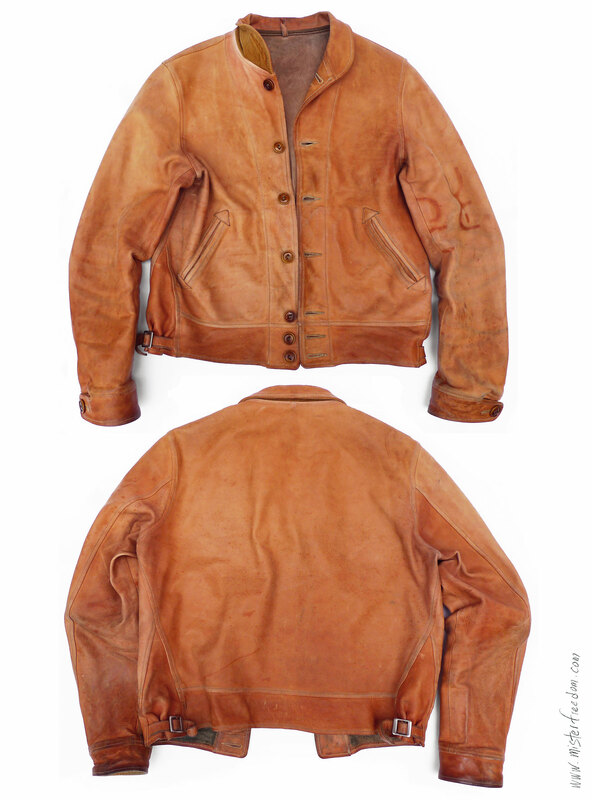 While out shopping for hides from local suppliers, we selected this particular leather not just for its convincing vintage orange-brown color, a rich cognac tone reminiscent of classic 40’s-50’s suede sportswear jackets, but also because of its durable quality feel, as this is a leather grade used to make western riding chaps. 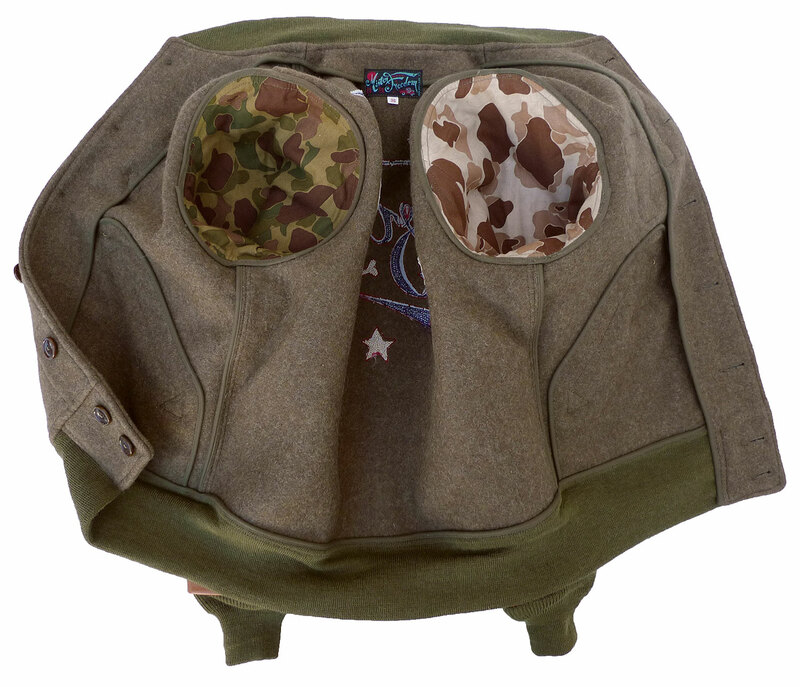 For those eagerly awaiting Mister Freedom® leather chaps, the wait is not yet over. 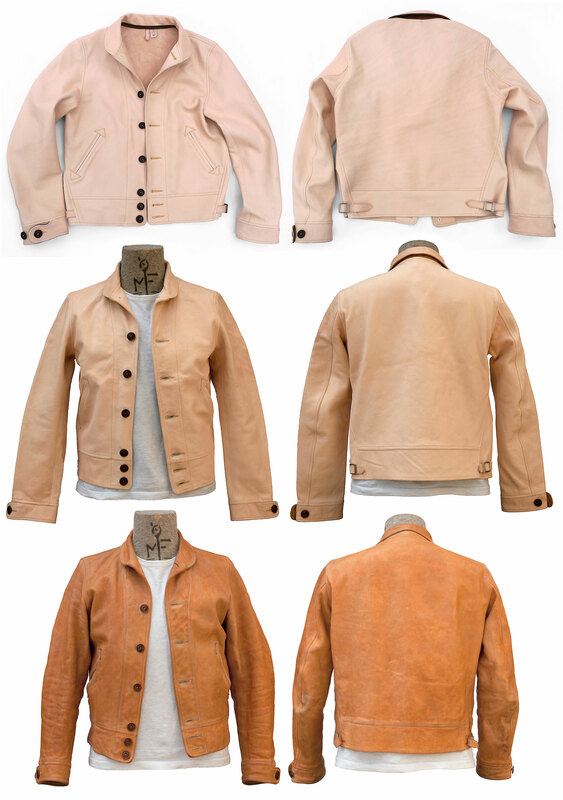 As its veg-tan cowhide Campus predecessor, initially introduced in 2013 and still produced today in the USA, the MF® “JOHNNY” is unlined. 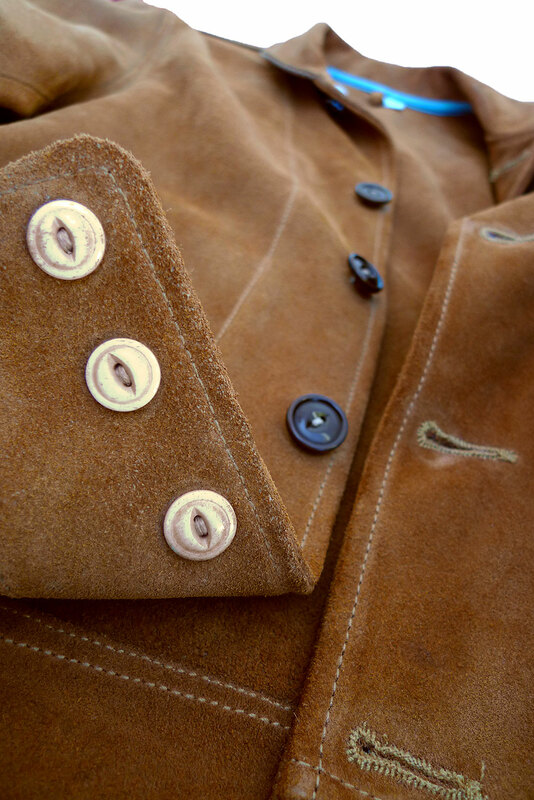 Not a way to save on lining fabric, but rather a nod to unlined “Cossack” leather sports coat models popular in the 1930’s, and a real challenge construction-wise when striving to keep clean seams inside & out. 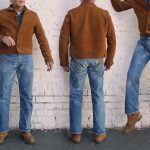 If the Veg-tan cowhide MF® Campus really takes on a new dimension and beautifies over time (according to the owner’s activity, leather expertise, frequency of wear, conditioning choices and patina preference), the JOHNNY is good-to-go from the get-go. 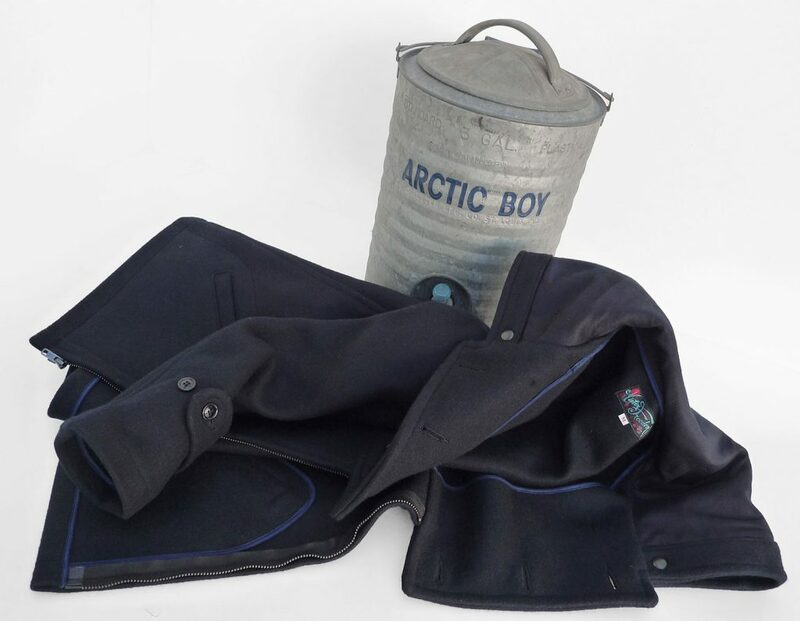 We do not recommend any initial special spraying or conditioning to make the garment weather-proof or stain-repellent. 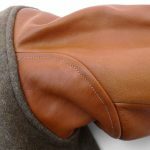 We have not tested anything really convincing on suede, most treatments will result in an irreversible darkening of the suede leather, and shoe products should definitely not be used on a sport jacket… The old standard practice of dubbing roughout service boots in the military (see tips from our friend Mosquito_Boat) doesn’t apply here. 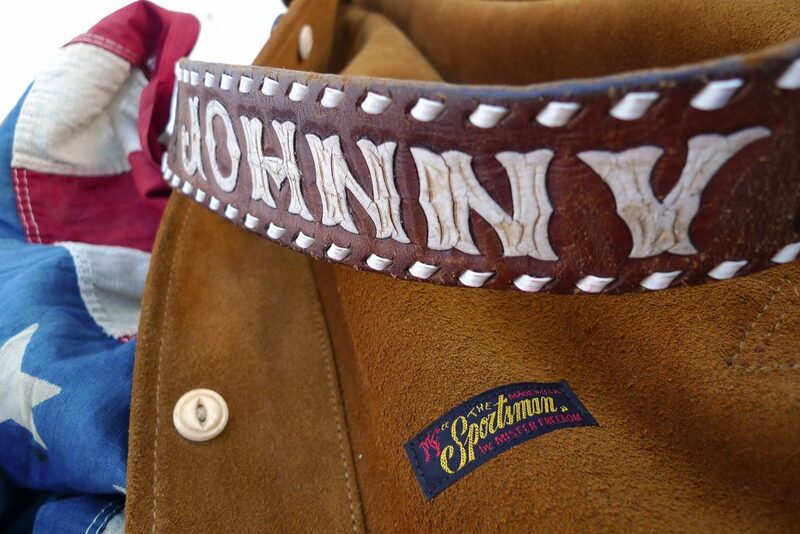 We believe that our “JOHNNY” Campus has its own dress-up feel, and will benefit from being kept ‘clean’ to age gracefully. 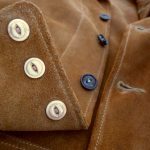 The desirable rugged attitude of its Veg-Tan cowhide counterpart properly-worn and conditioned (see the amazing results on Vintage_Engineer_Boots‘ own Campus jacket, with the whole process detailed here) may not work with this suede leather release. 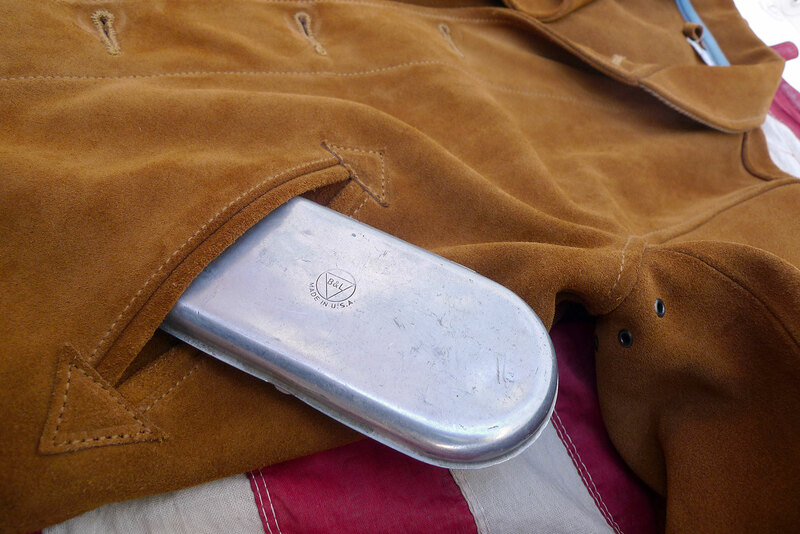 We might be proven wrong and come across a beat-up “JOHNNY” specimen with killer natural patina in a few years (keep an eye on the ultra-talented artist Mark Maggiori‘s IG), but until then, understand that it’s the nature of a casual suede leather sport jacket to be vulnerable to the elements, and Ketchup®. Please wear and feast accordingly. 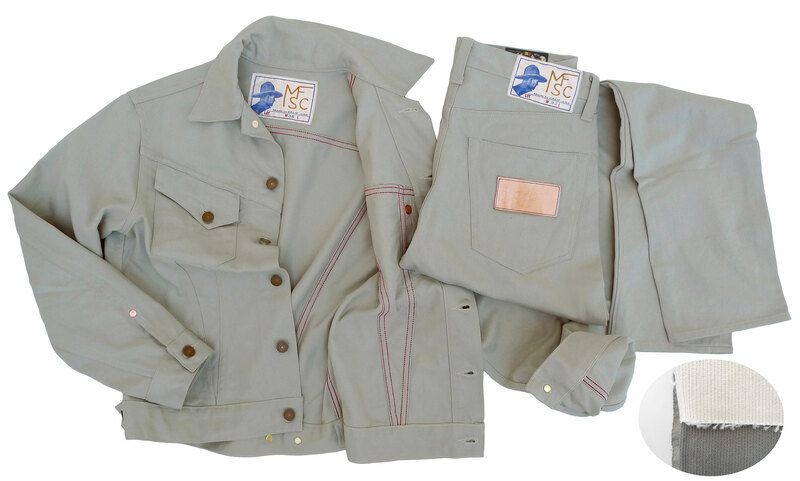 The rugged MF® Veg-Tan Campus jacket initially released in 2013. 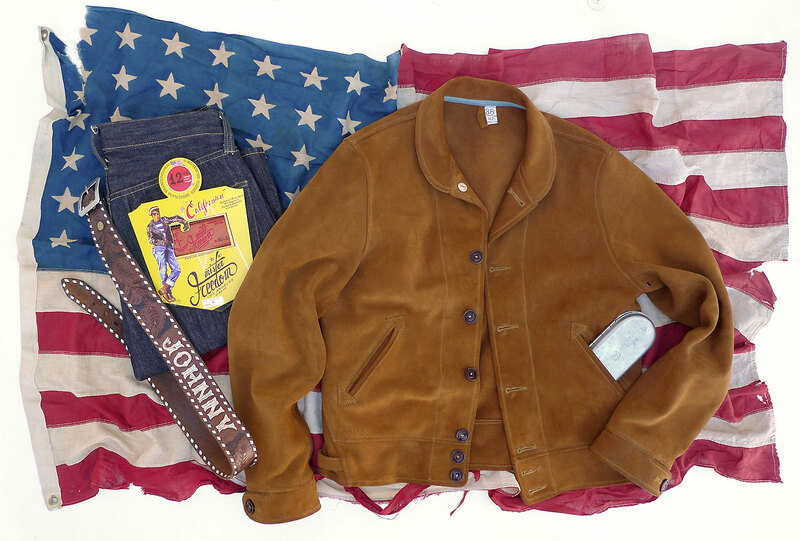 The MF® “JOHNNY” Campus in suede cattlehide is designed and made in California by Mister Freedom®. 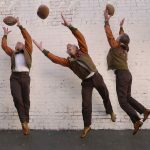 PATTERN: An original pattern inspired by 1930’s sportswear type lightweight and unlined leather jackets. 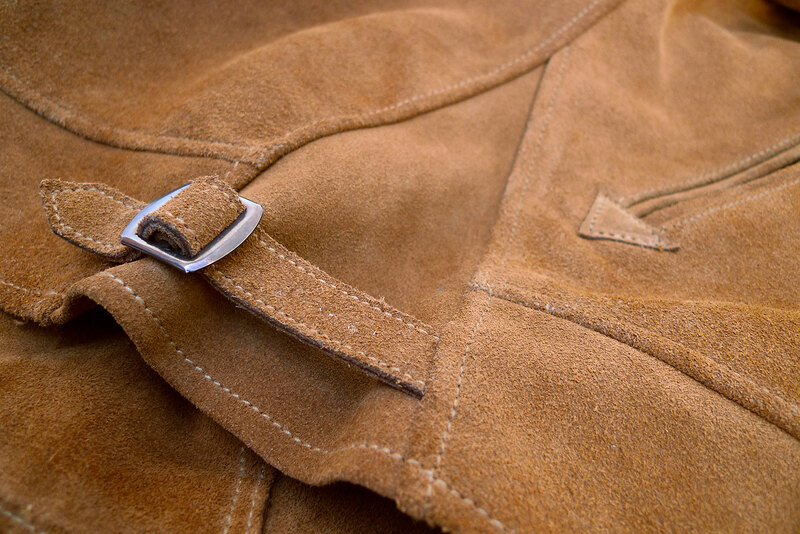 LEATHER: Durable and supple suede cattlehide with a soft nap, aka cow-split leather, a grade used to make western riding chaps. Cognac color. * Fully unlined, clean seams inside & out. 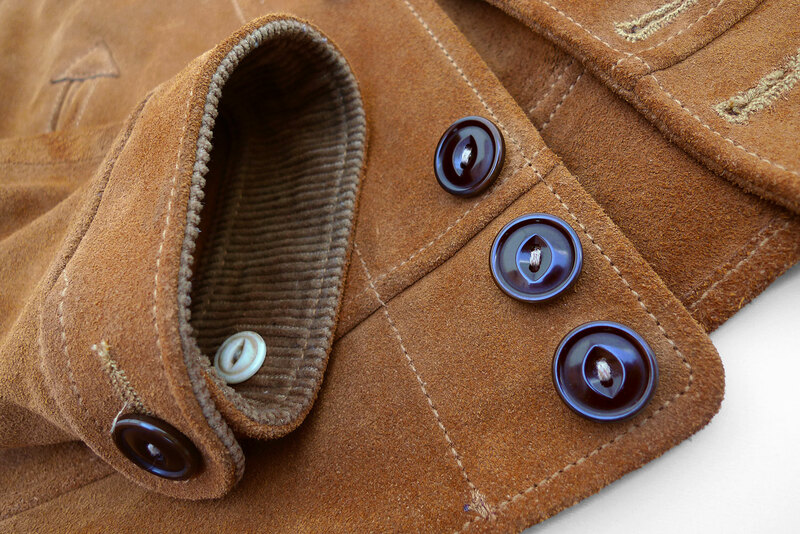 * Brown ‘Cat-Eyes’ corozo wood buttons (aka ivory nut), backed by contrasting ivory-color corozo support buttons. 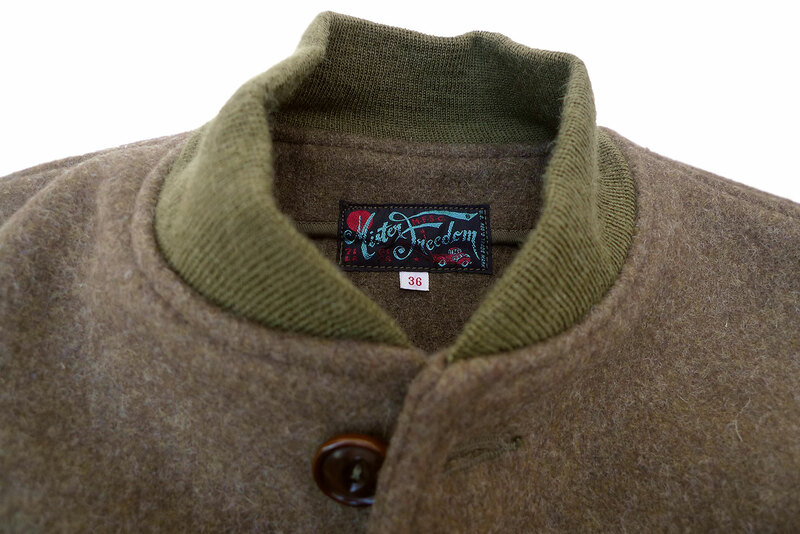 The MF® “JOHNNY” Campus Jacket does not require any type of pre-treatment or conditioning and is ready to wear as-is. 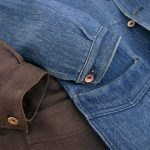 This garment is cut quite slim but is considered true-to-size. 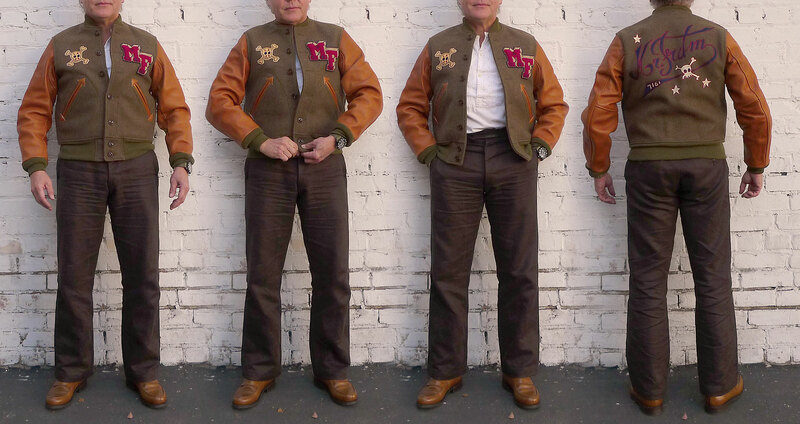 I wear a slim-fitting size 38 in the “JOHNNY” Campus Jacket, my usual size in mfsc jackets. 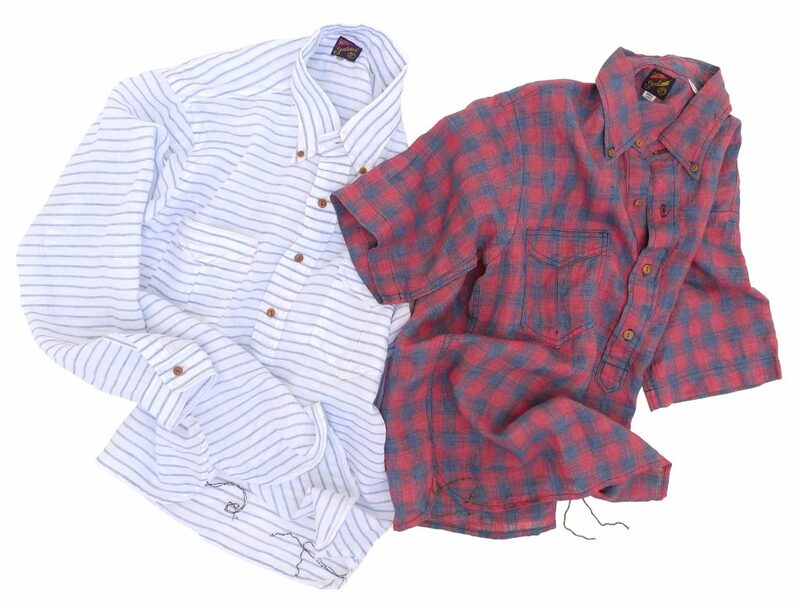 Keep in mind that we are referring to a classic old-school type fit, not a contemporary streetwear silhouette. Please refer to approximate measurement in chart below. It does not require any type of pre-treatment and is ready to wear as-is. Cleaning should be left-up to your local professional leather cleaning environmentally-friendly facility. 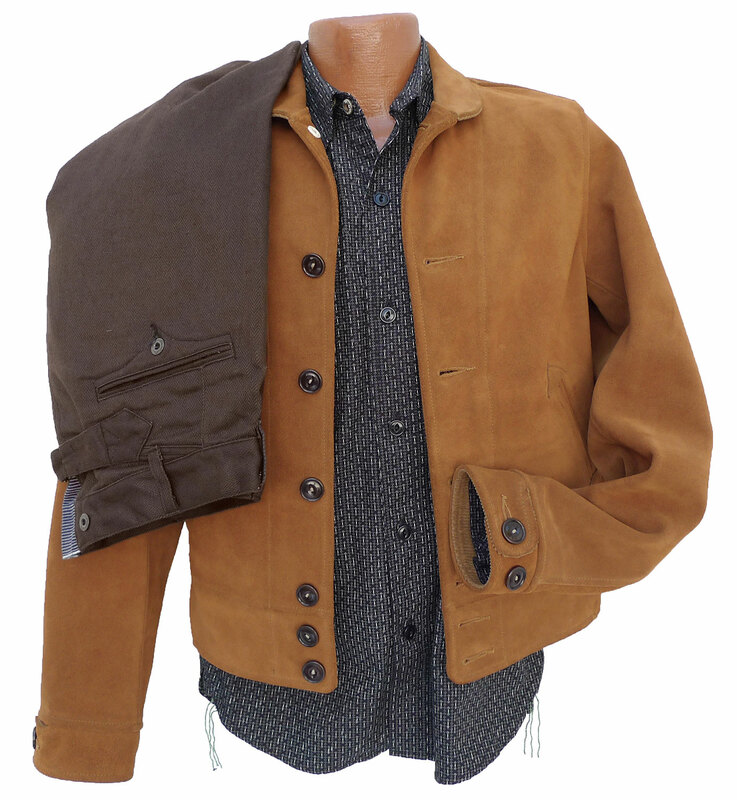 DISCLAIMER: Due to the unlined quality of this jacket, some staining of a garment worn under or over might occur. 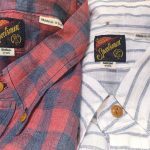 Please consider that color transfer on a light color shirt might be challenging to remove with regular laundry methods. 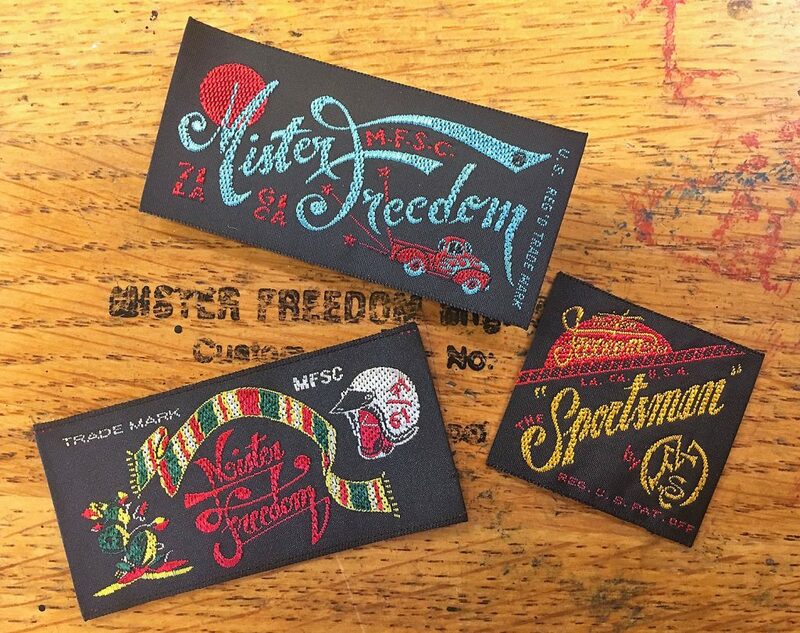 Available from www.misterfreedom.com , from our funky brick and mortar store in Hollywood, CA., and from a few selected fine boutiques around the World. Please call 323-653-2014 or email sales@misterfreedom.com with any questions not answered above. And no, it doesn’t come in black.